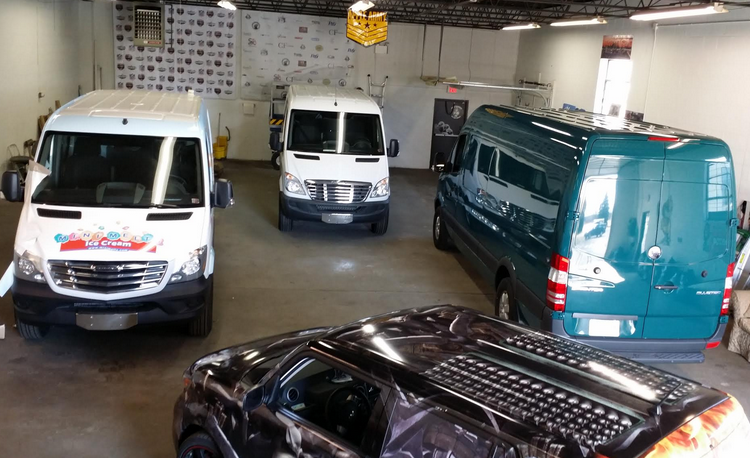 If you take a minute to look around the next time you’re on the road, you might be surprised at the volume of wrapped vehicles you see. 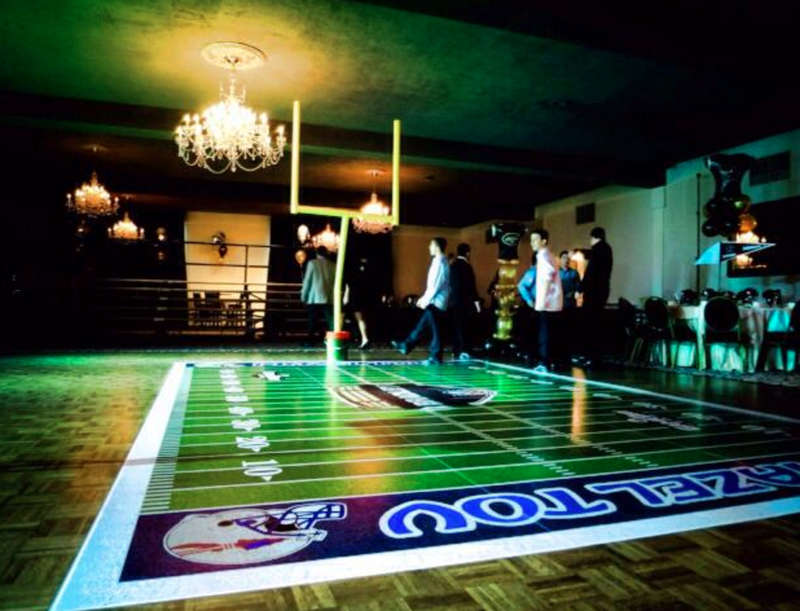 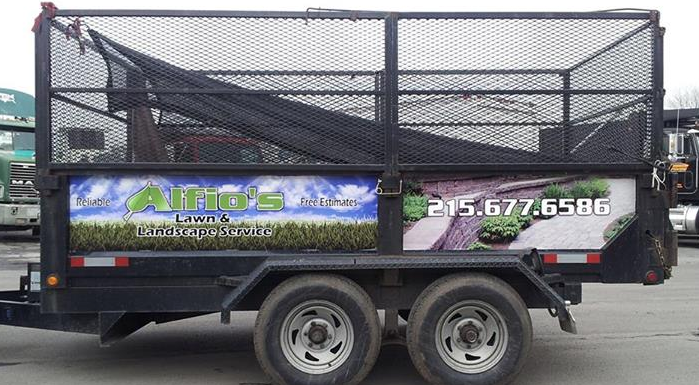 Nowadays, business owners are on top of their games. 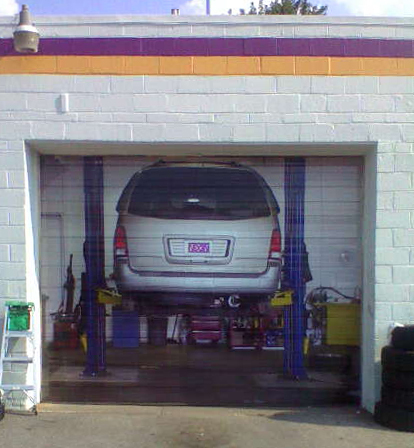 They know that it takes a creative mind and a dedicated approach to ensure that a company remains ahead of the competition. 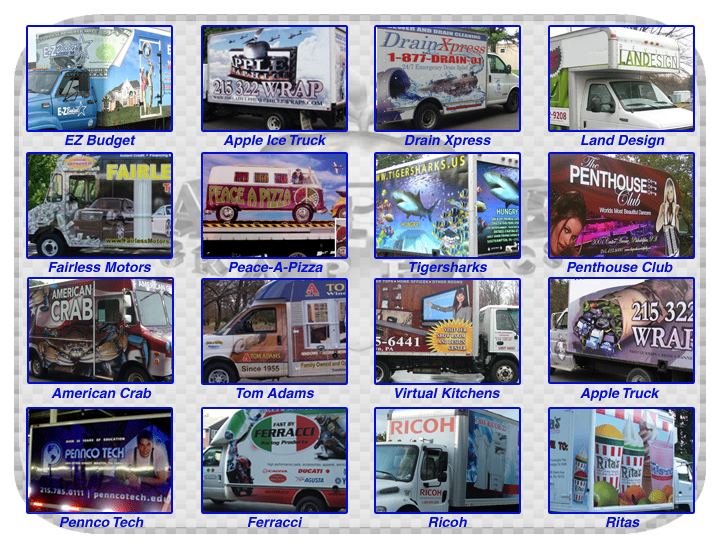 At Apple Graphics, we understand that you want to use only the best forms of advertising for your business. 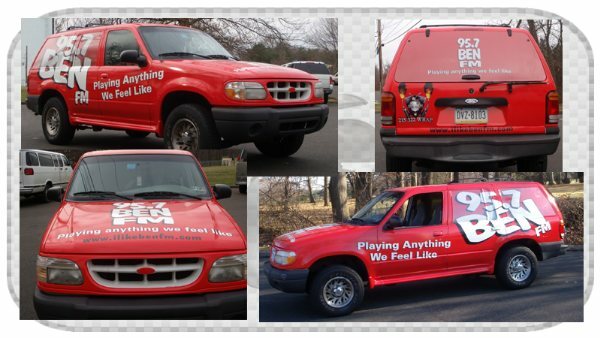 That’s why we work with people from all over the Bucks County and surrounding area to create custom and professional vehicle wraps for their businesses. 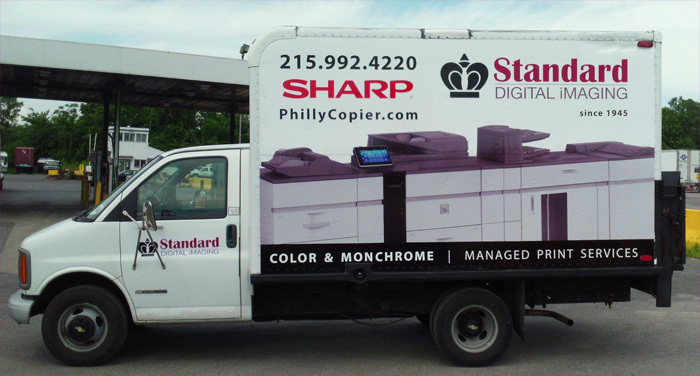 If you’re looking for an innovative way to express your brand, and if you’re tired of relying on the same old print media for your advertising means, then Apple Graphics has exactly what you need. 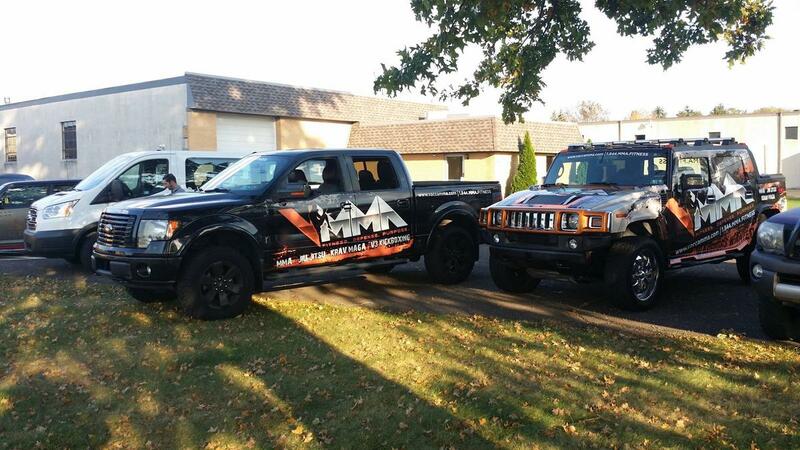 We work with clients from all walks of life. 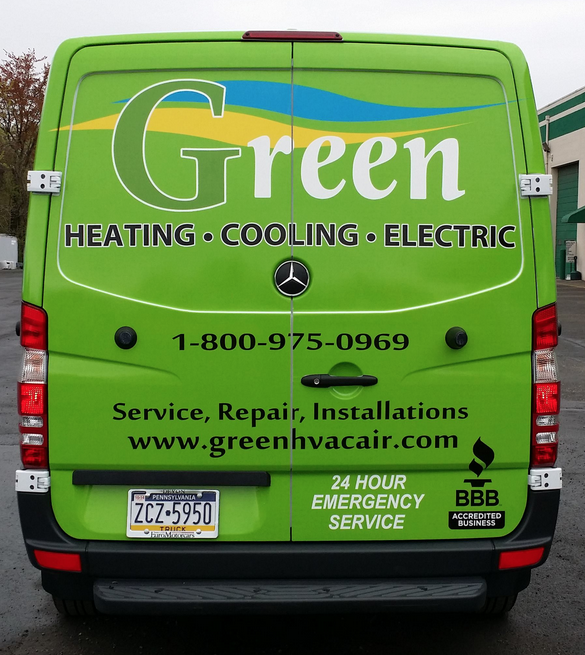 The common theme in all of our work is top-notch customer service coupled with professional design. 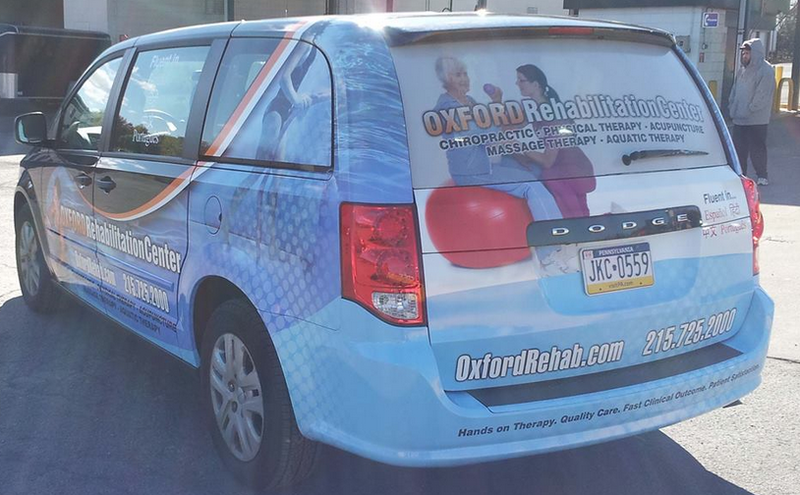 No two Apple Graphics installations are the same and only the highest quality care is provided on each and every one of our wrapped vehicles. 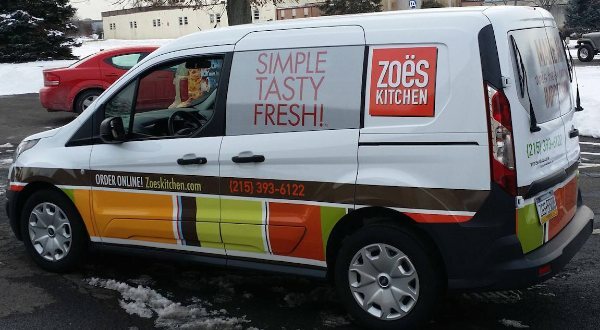 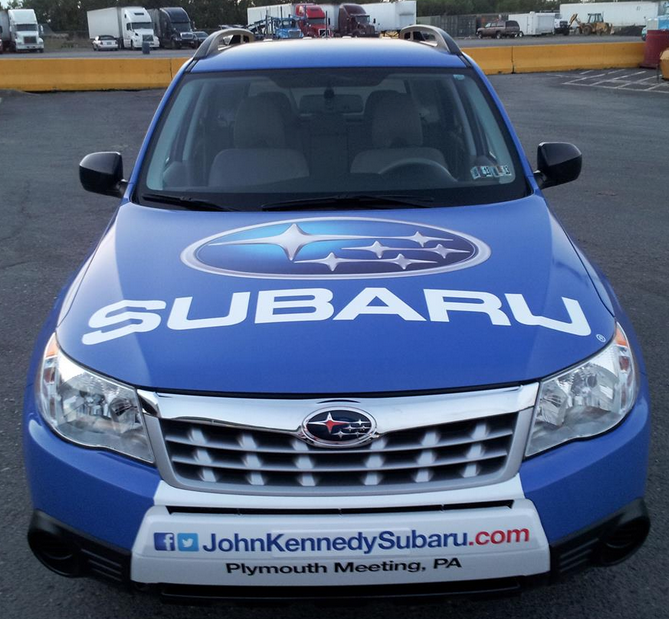 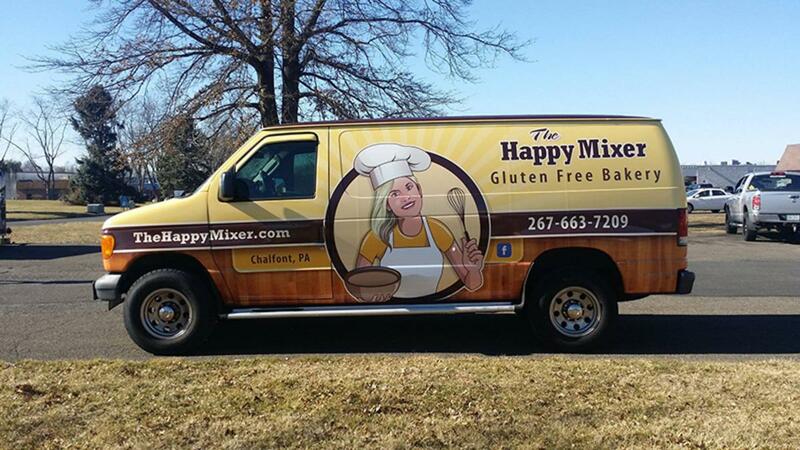 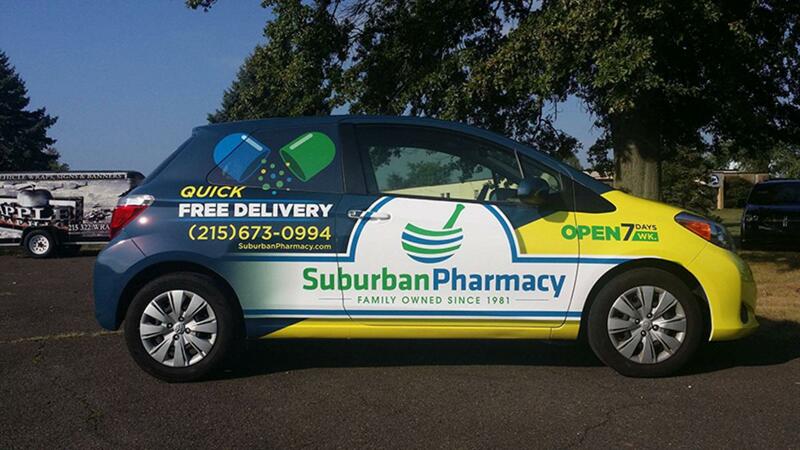 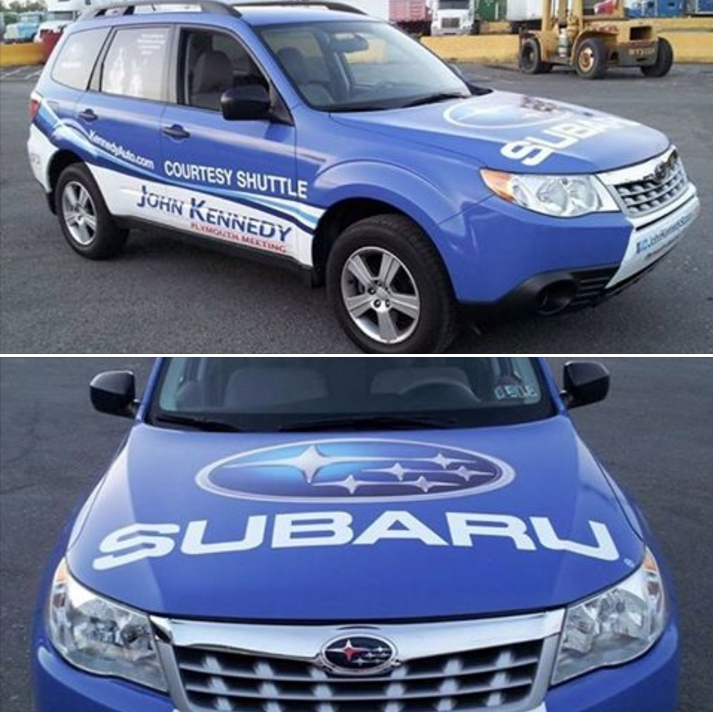 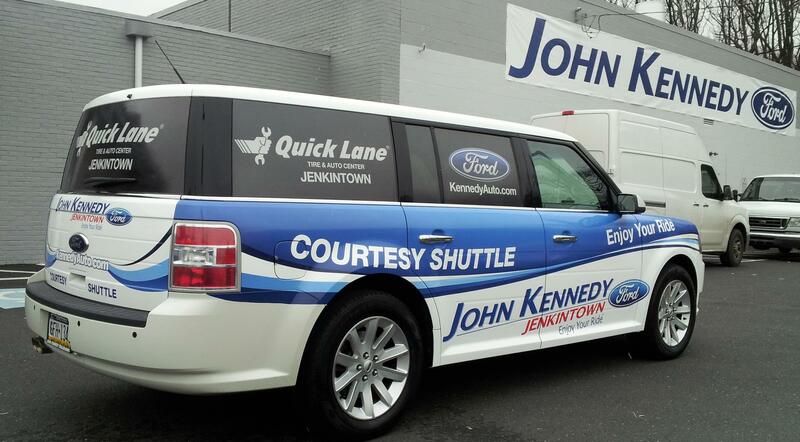 When it comes to fleet wraps in the Bucks County and surrounding area, Apple Graphics can’t be beat. 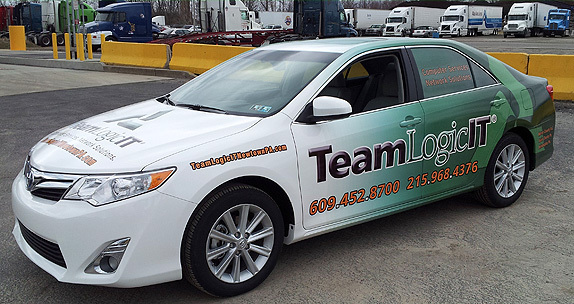 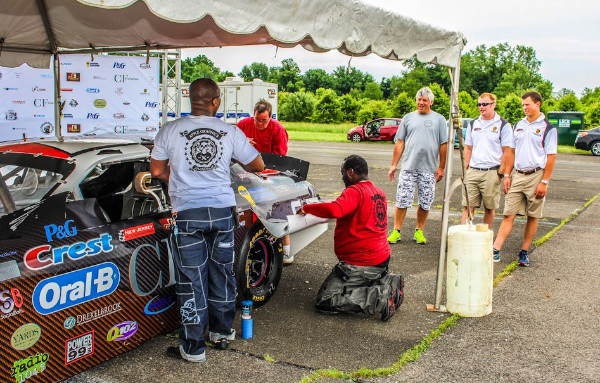 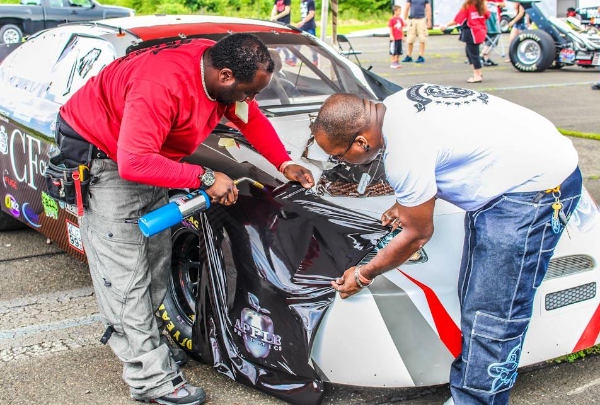 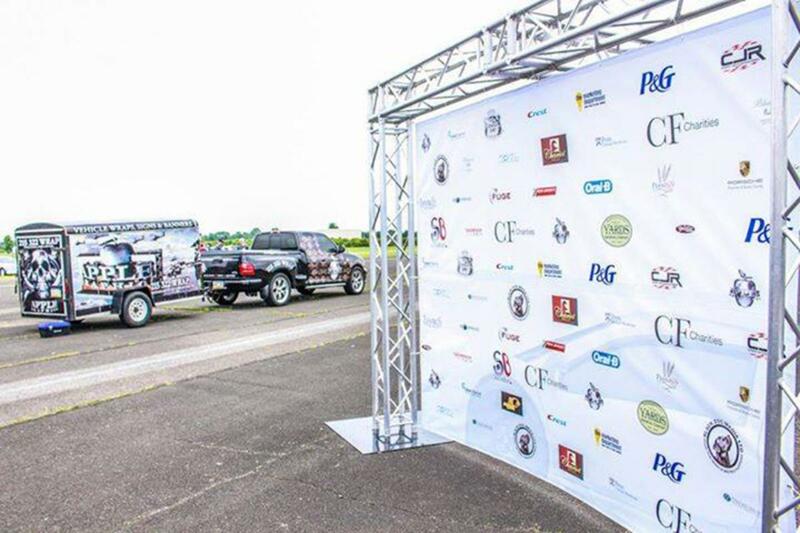 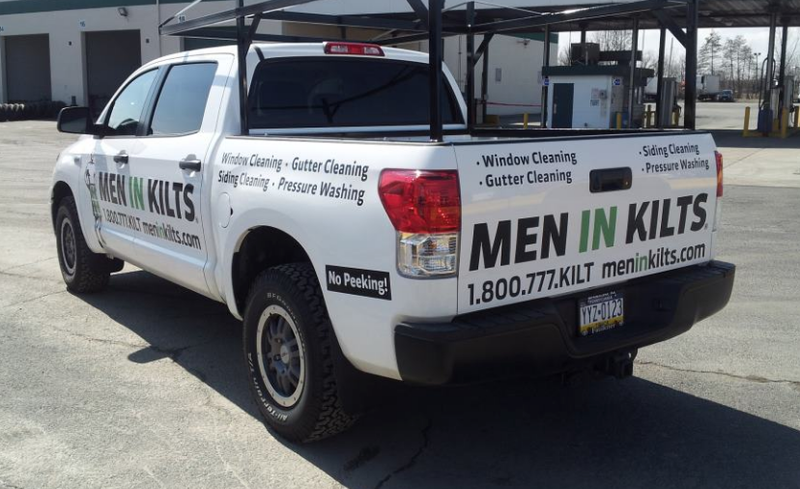 As the leaders in fleet wraps for Pennsylvania, we work diligently to ensure that your contractor wraps and franchise wraps exceed your expectations. 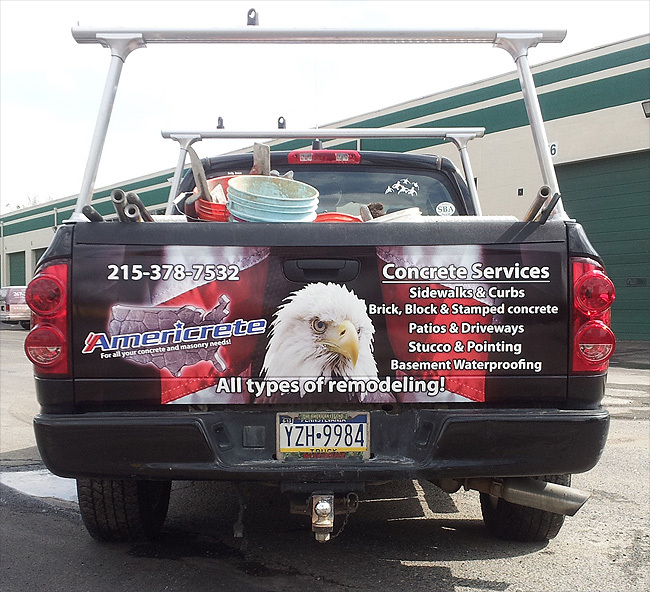 We guarantee that you’ll leave satisfied with whatever work we’ve completed. 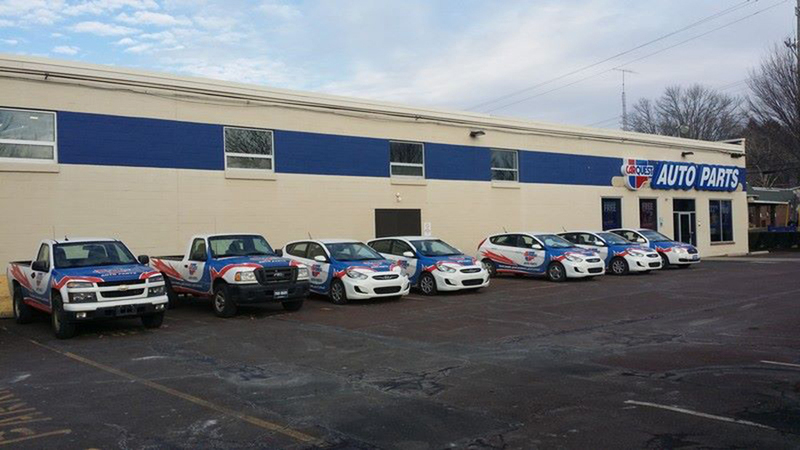 If you need a fleet wrapped with your long-standing company logo, our crew is ready to get a design created to suit your needs. 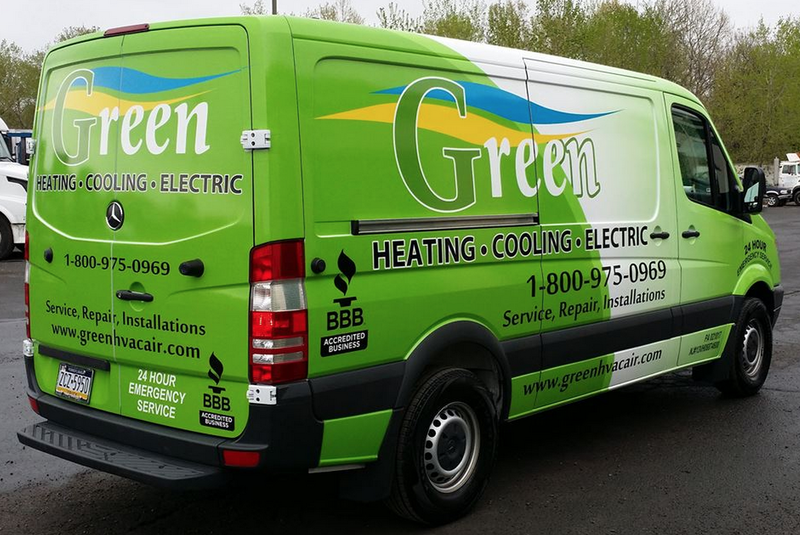 If you need a little creative spark, or if you just aren’t sure about how to get started, our team can assist you with creating a design that’s both road-worthy and memorable. 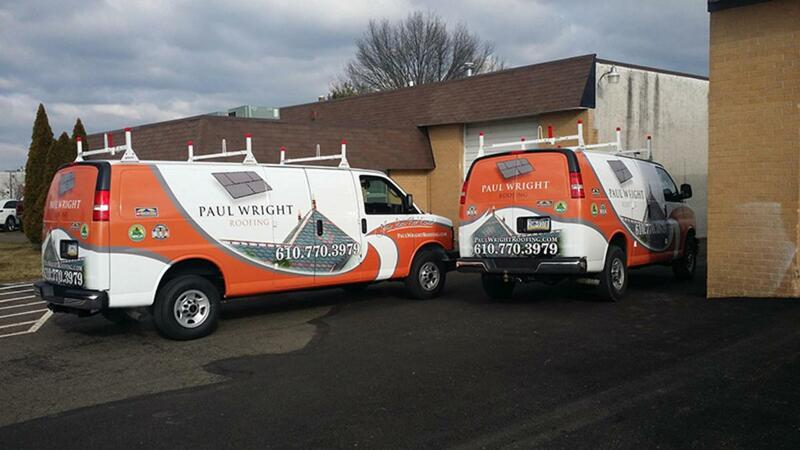 Nowadays it’s more important than ever to stand out from the competition. 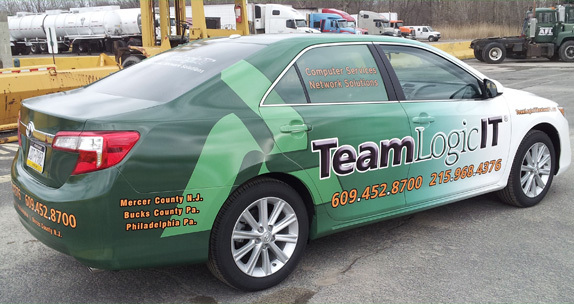 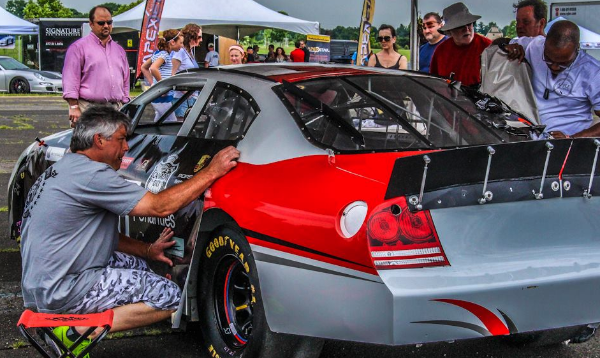 With a quality wrap installation form Apple Graphics, your vehicle or fleet will turn heads. 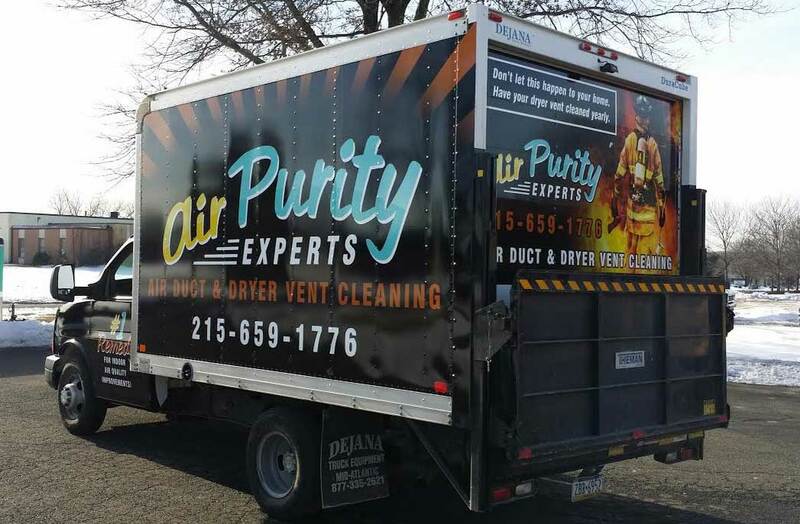 Customer satisfaction is our number one priority, and we’ll do whatever it takes to leave you completely happy with our services. 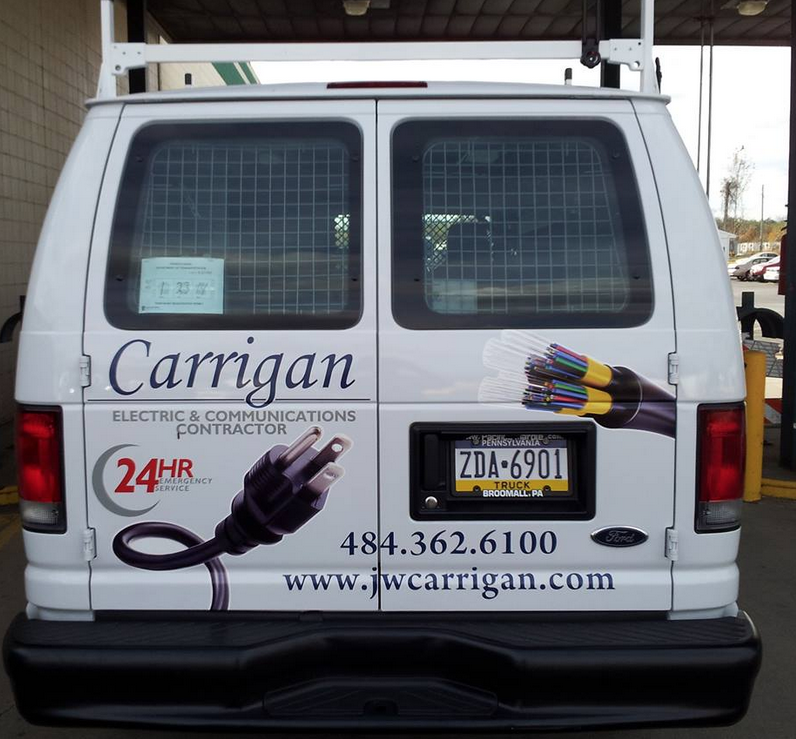 The next time you need to create a custom design for your company’s fleet, stop in and chat with one of the installers at Apple Graphics. 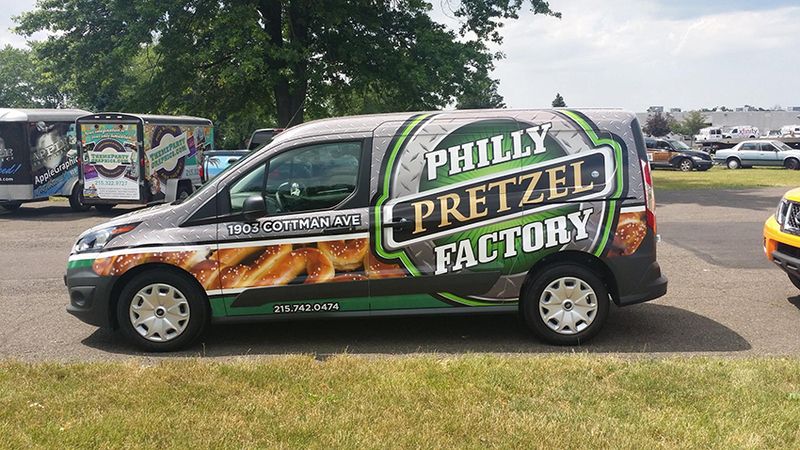 We can help you come up with a new twist for your brand, or we can get you started from the ground up with a brand-new creation. 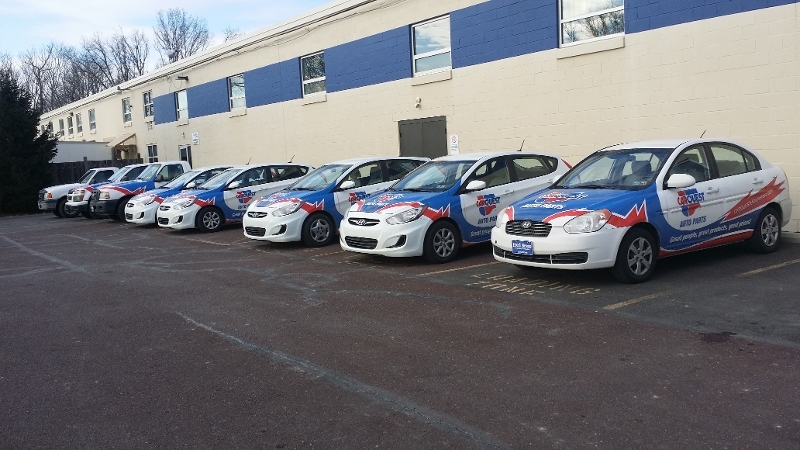 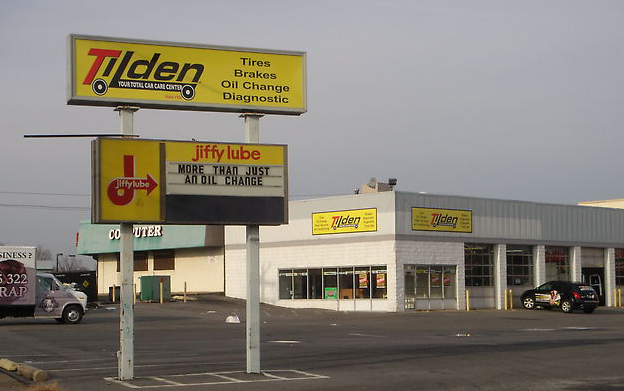 The options are endless, and you’re guaranteed to walk away satisfied with our service. 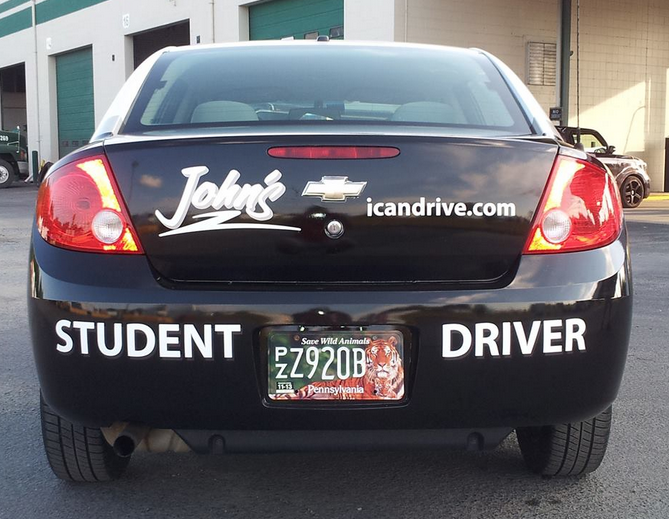 The next time you’re out on the road, take a look at the vehicle next to you. 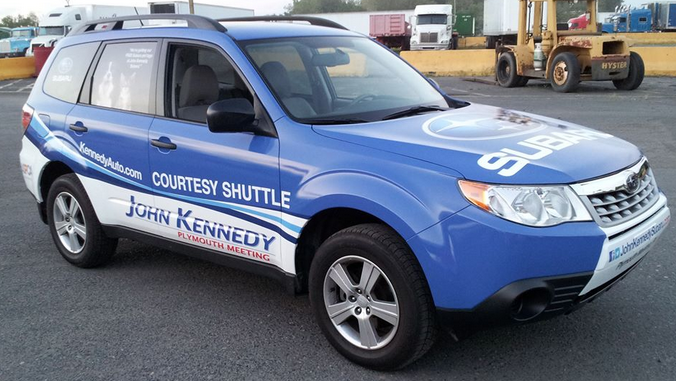 Chances are, at some point in your travels, you’ll see a professionally wrapped vehicle by your side. 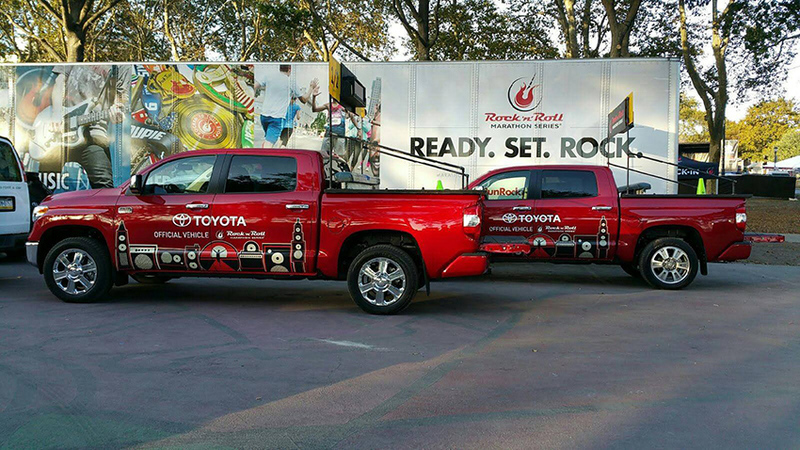 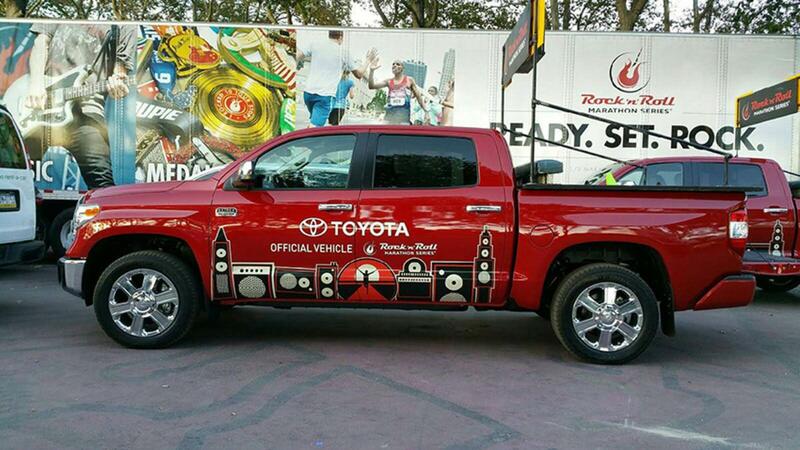 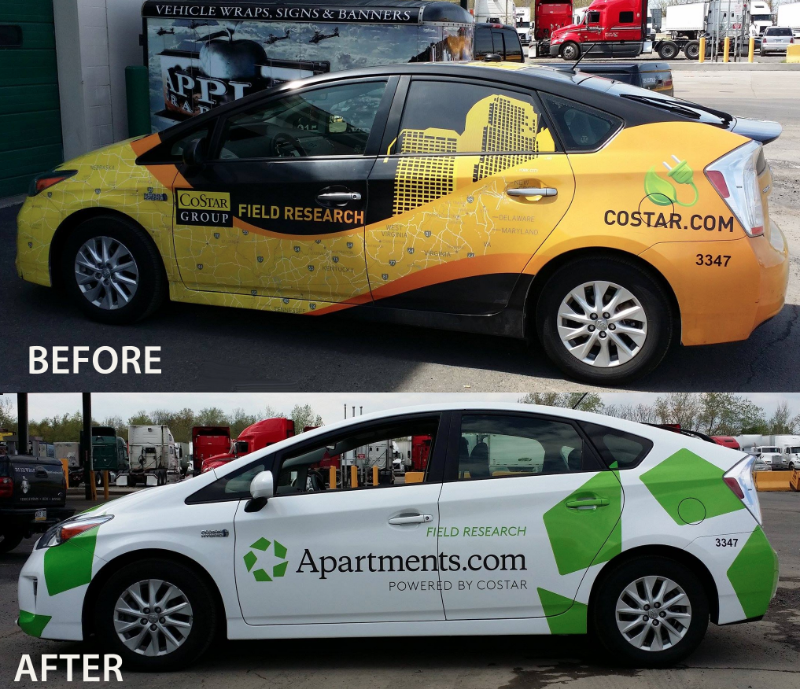 With the ever-increasing popularity of alternative advertising modes, vehicle wraps are becoming more commonplace. 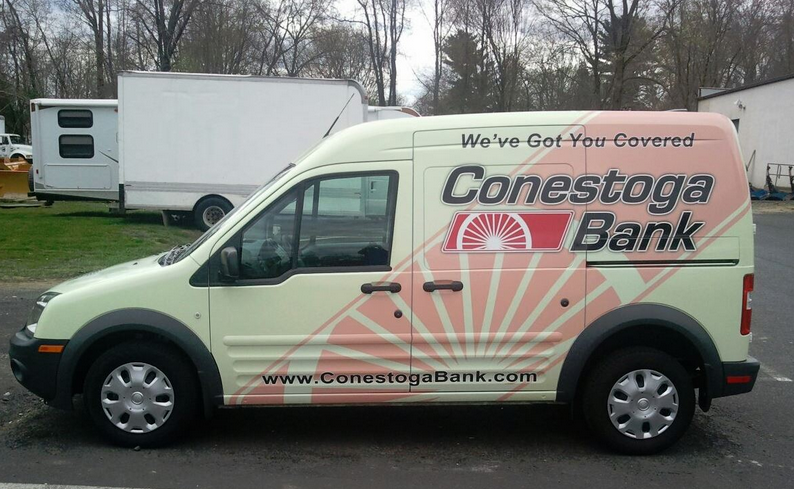 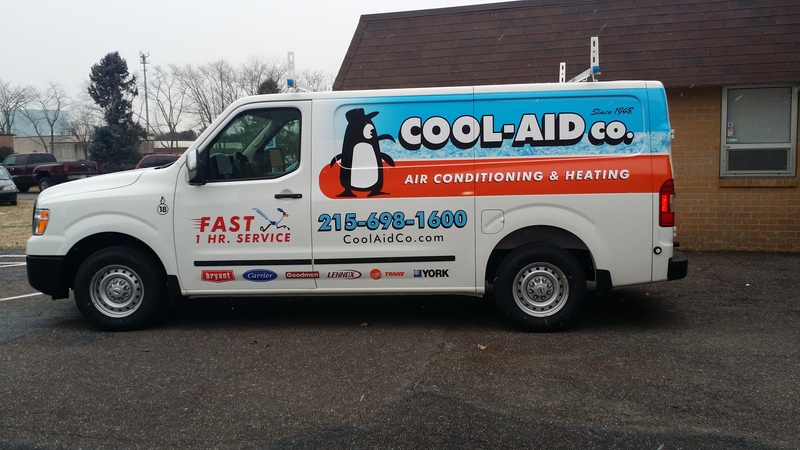 Vehicle wraps are an excellent option for those savvy business owners who are looking for a fresh new way to advertise. 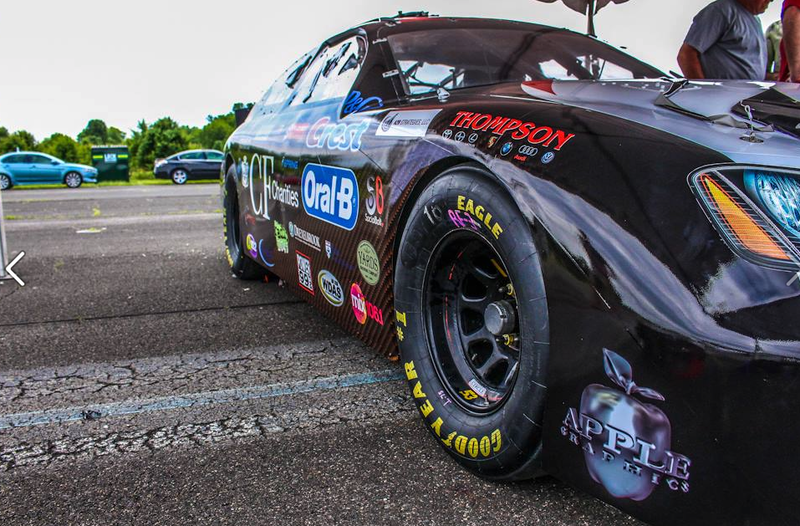 At Apple Graphics, we know that it’s important for your company to have a visible brand, and we’re ready to help you do what it takes to get it noticed. 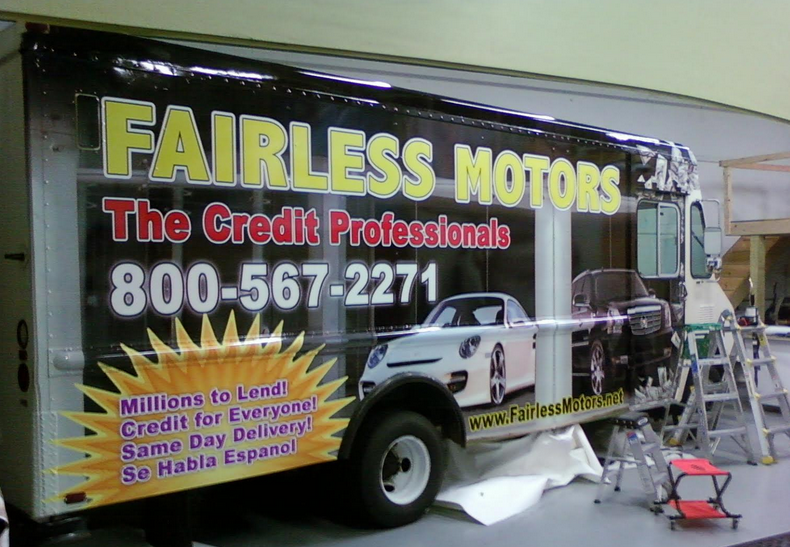 What many people are now discovering is that they have many options when it comes to vehicle wraps. 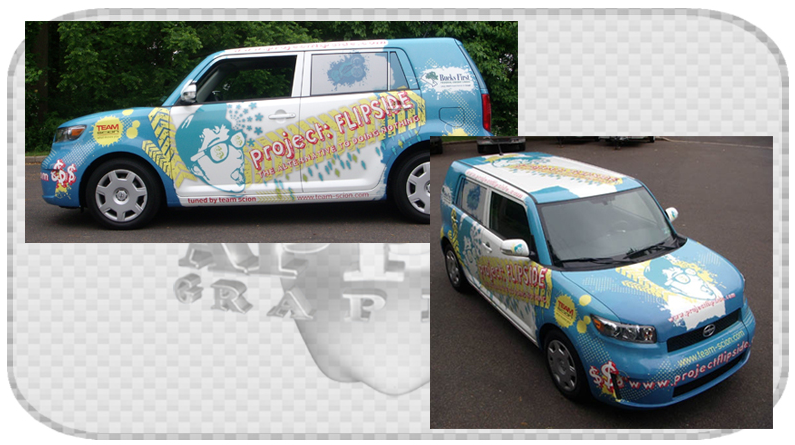 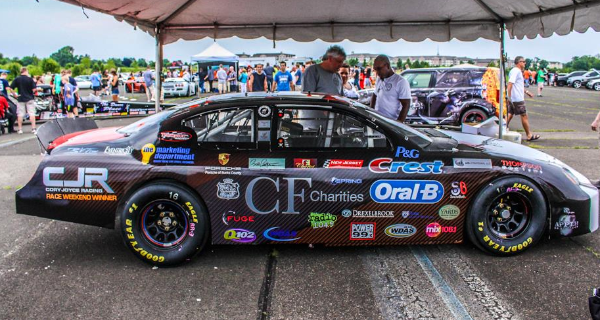 At Appel Graphics, we can wrap anything that you desire, whether it be a single car, or an entire fleet. 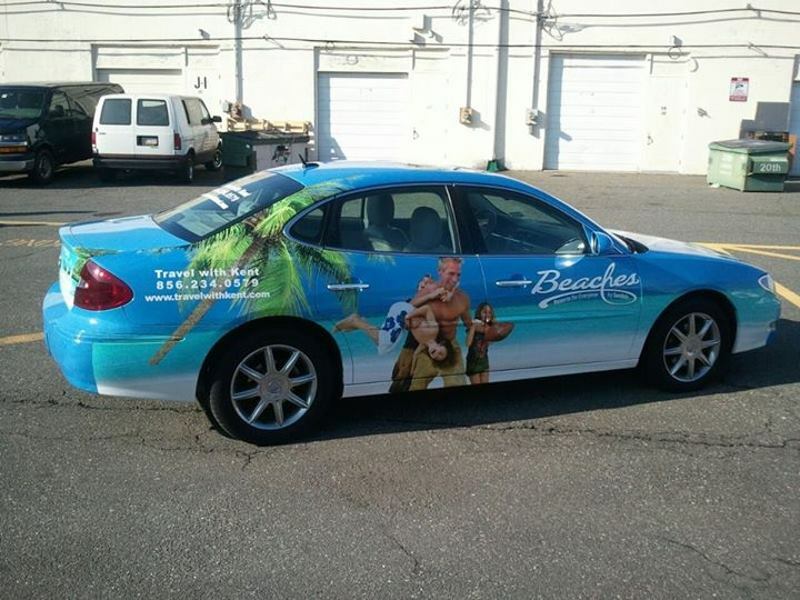 We also offer partial vehicle wraps, as well. 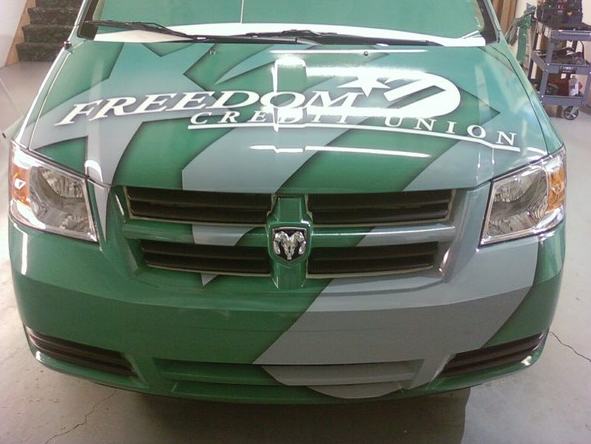 Partial wraps are an excellent way to get your vehicle noticed out on the road, but at a fraction of the cost of a full wrap. 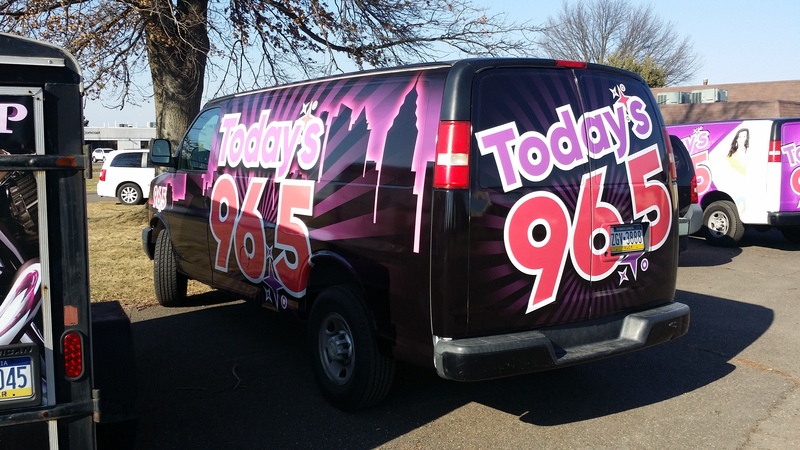 Research has proven the effectiveness of mobile wraps and its estimated that a professionally wrapped vehicle can generate thousands of impressions a day. 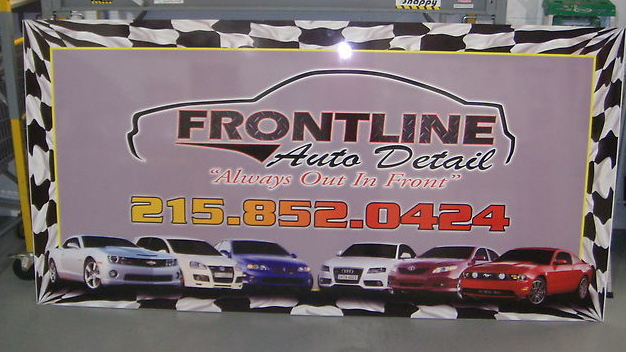 A customized partial wrap can be created so that it covers only a portion of your vehicle. 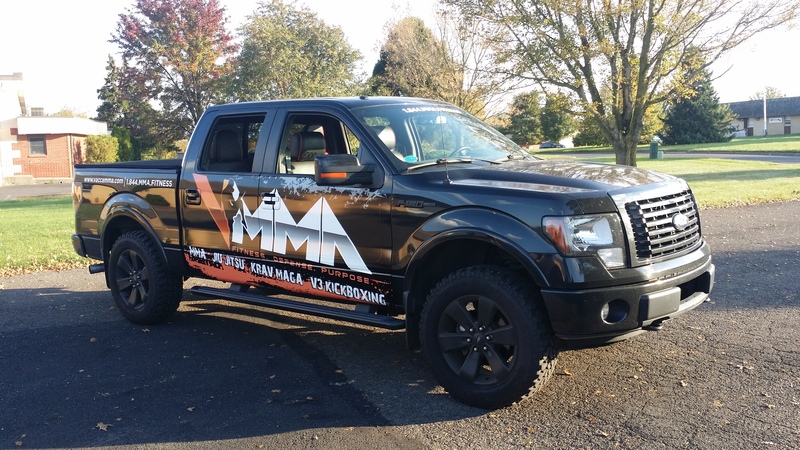 The skilled technicians at Apple Graphics can work with you to create a personalized, unique wrap that speaks to your individual brand. 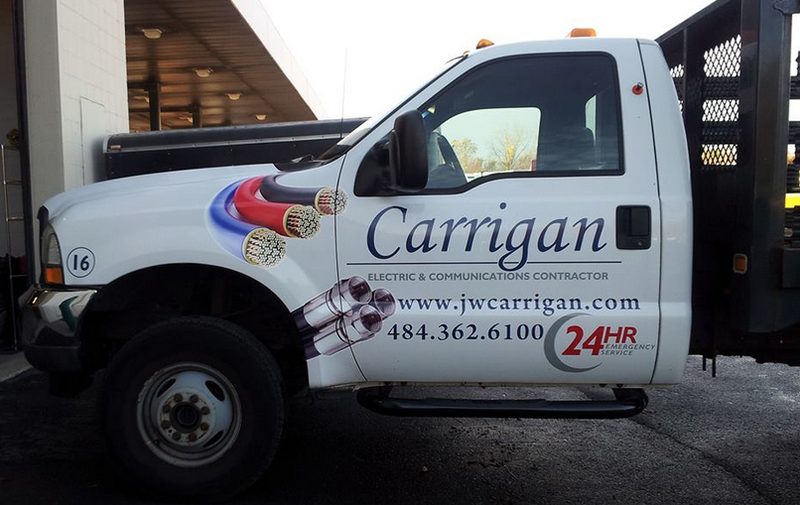 We know that you want to stand out from the competition, and we also know that you don’t want to spend an arm and a leg doing so. 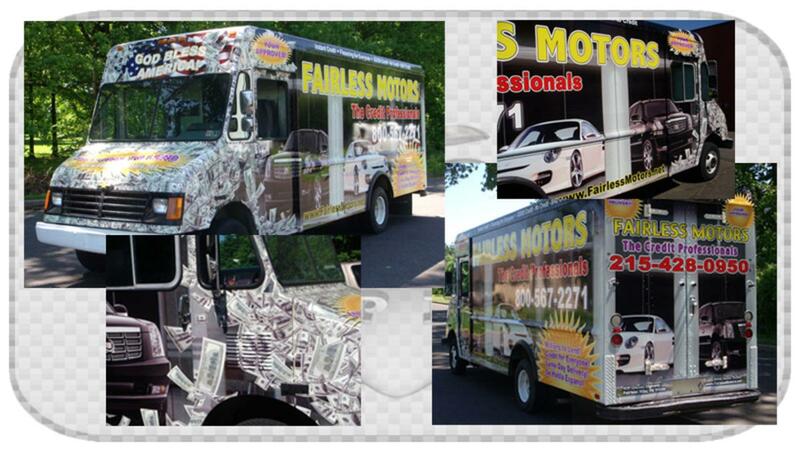 Many of our partial wraps can be created with such expertise that they actually embody the essence of a full wrap. 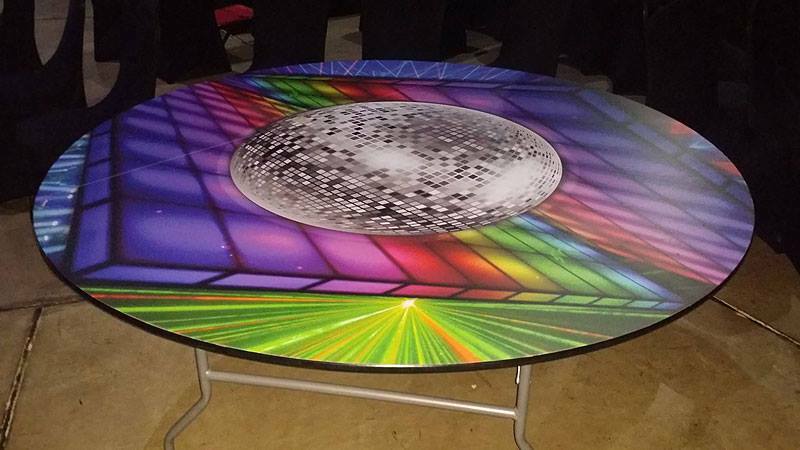 Our expert designers have logged in hours of work at their craft and they know what it takes to create an eye-catching, unique design. 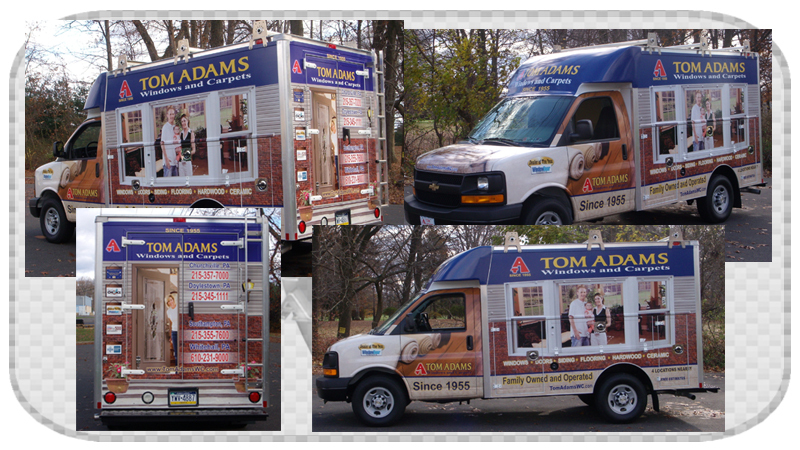 Partial wraps range from a quarter of a full wrap in size down to three-fourths of a wrap size. 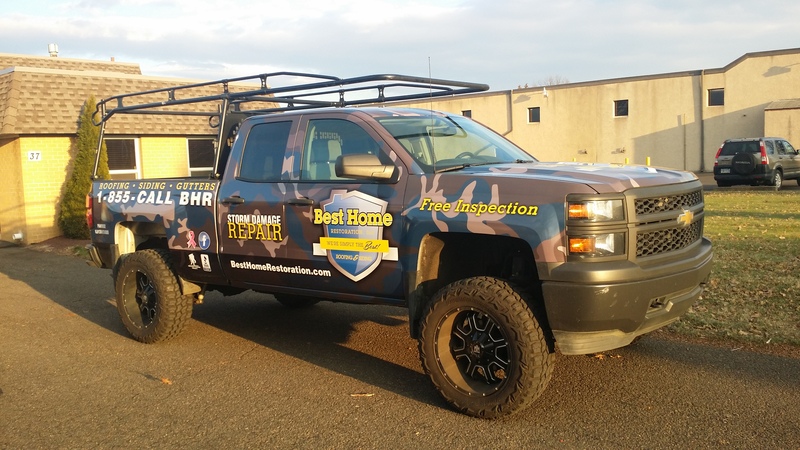 You have your choice in the design, and our skilled installers can help you come up with something that will be memorable for years to come. 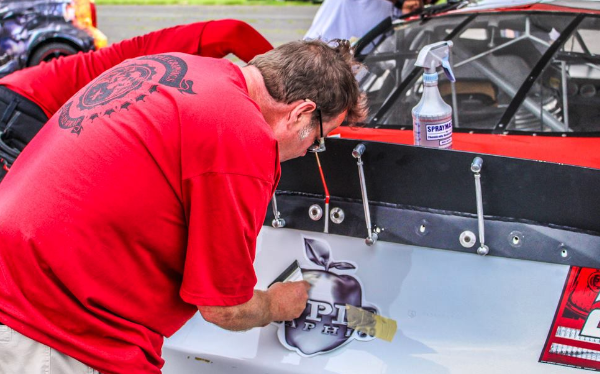 Some people like the look of a decal, and others like the look of a larger design surface. 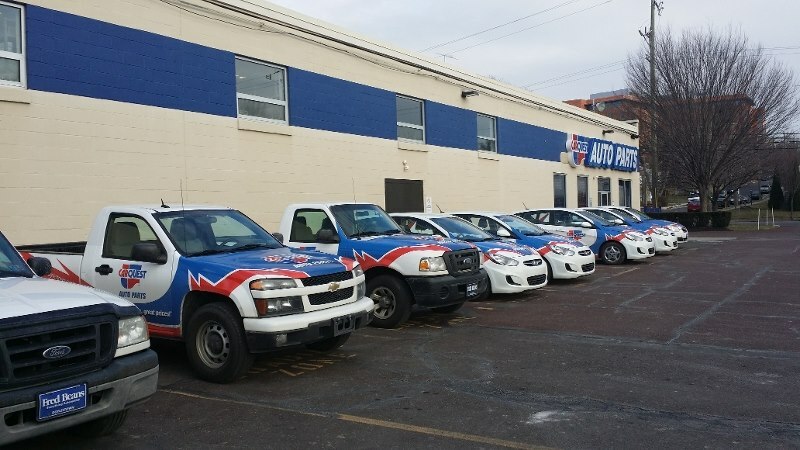 Whatever your individual preferences, we can work with you to ensure that you leave with something that represents your particular business in the most unique and professional way. 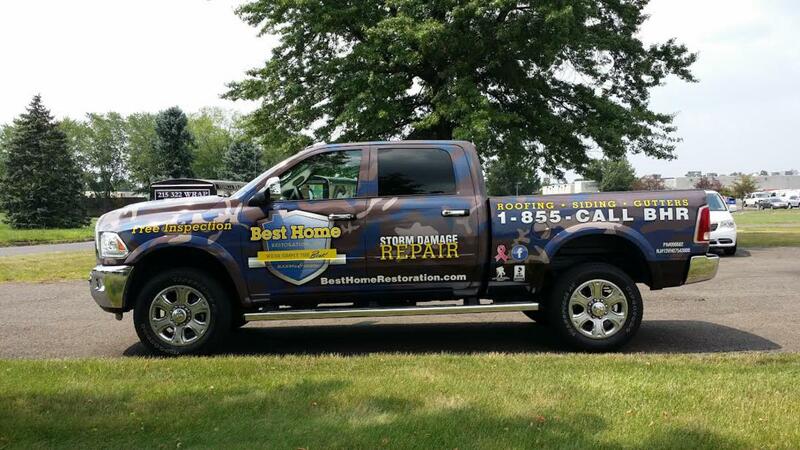 If you’ve had a car out on the road recently, then chances are you’ve seen a few wrapped vehicles. 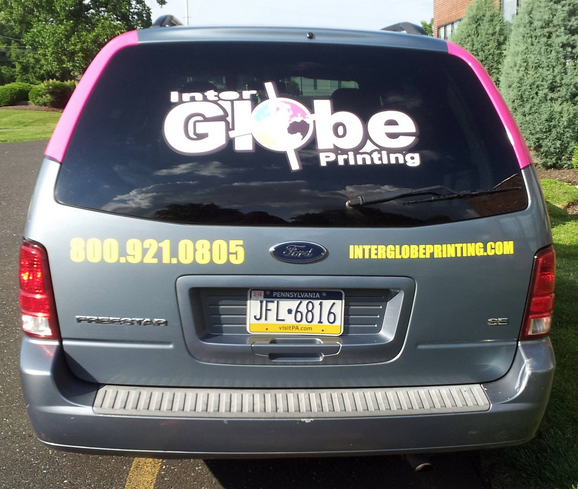 Vehicle wraps are now one of the best methods of advertising for both small and large businesses. 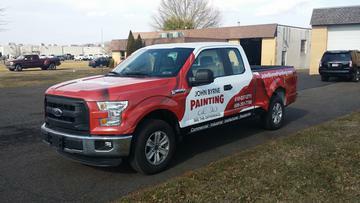 With a custom vehicle wrap, you can count on your brand being noticed while out on the roadways. 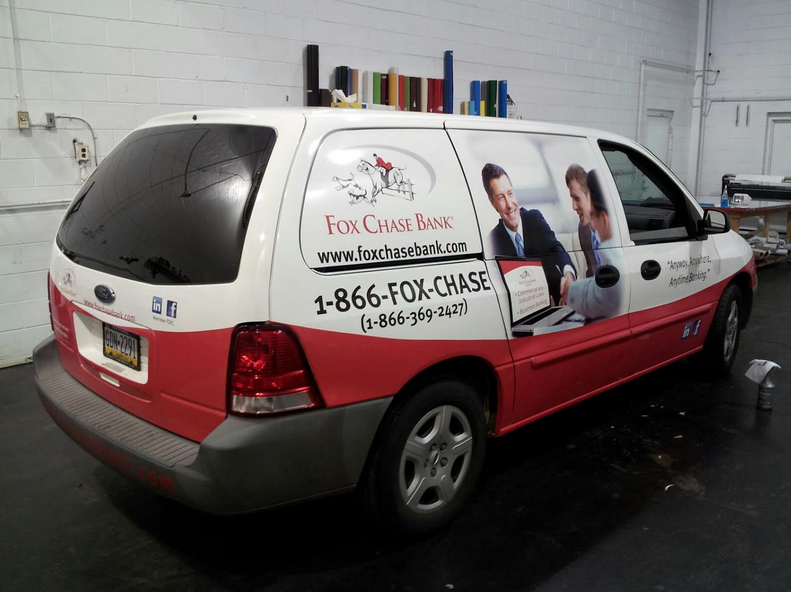 What’s more, a custom vehicle wrap can be designed so that it reflects exactly what you want your potential customers to see. 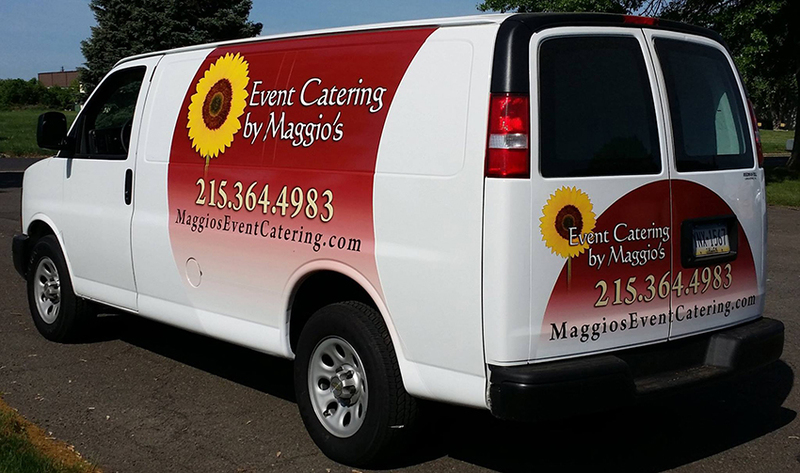 At Apple Graphics of Philadelphia, we know that promoting your brand with both creativity and professionalism is the key to ensuring a thriving business. 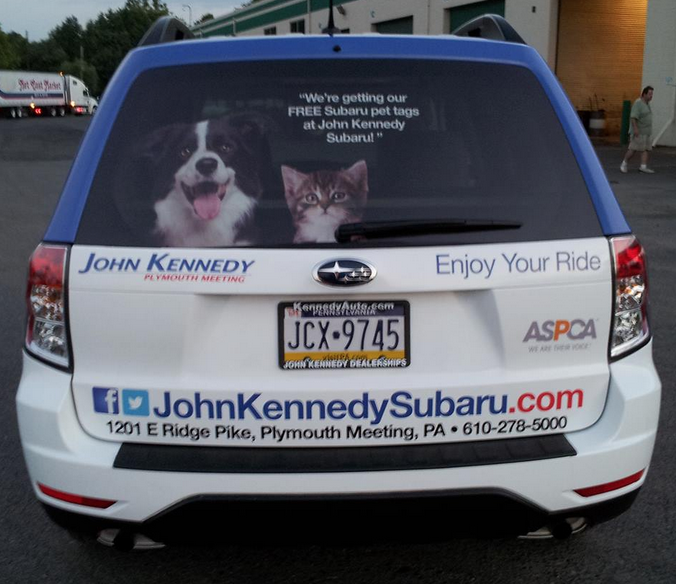 Business owners aren’t limited to just personal vehicles, either. 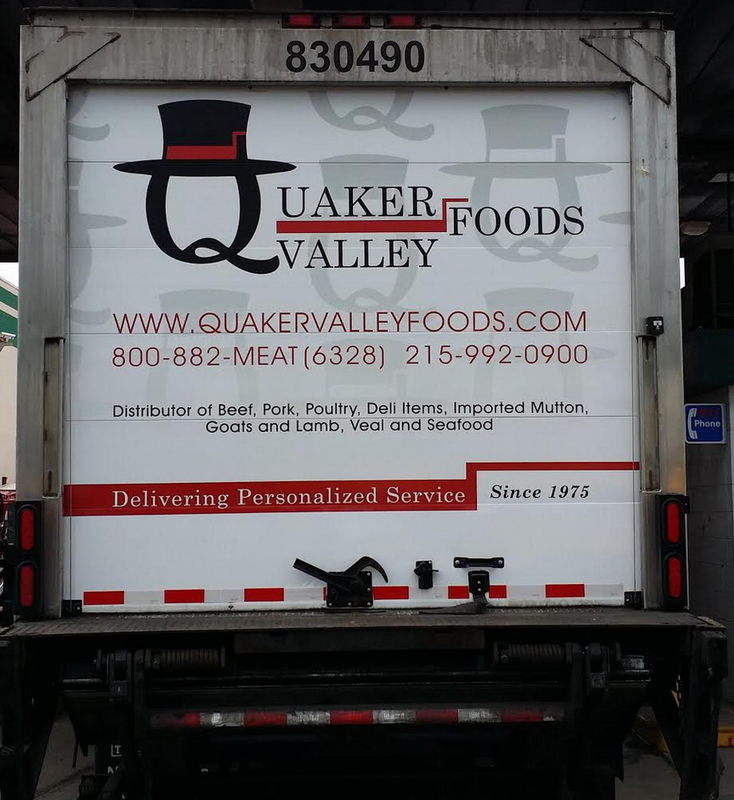 We can create a fully customized wrap for your tractor trailers, as well as your box trucks. 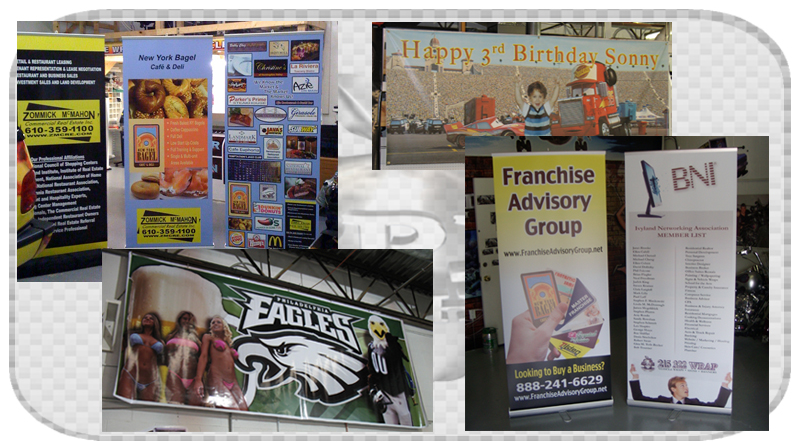 Nowadays, it’s crucial to ensure a top-notch advertising plan if you want to be successful. 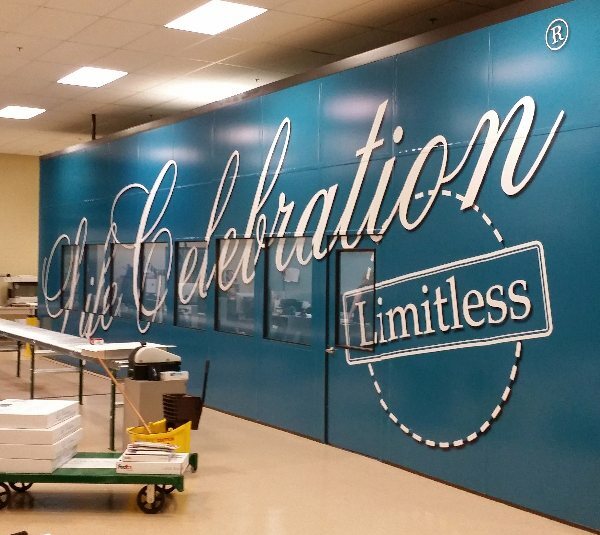 The skilled installation technicians at Apple Graphics can help you achieve this goal. 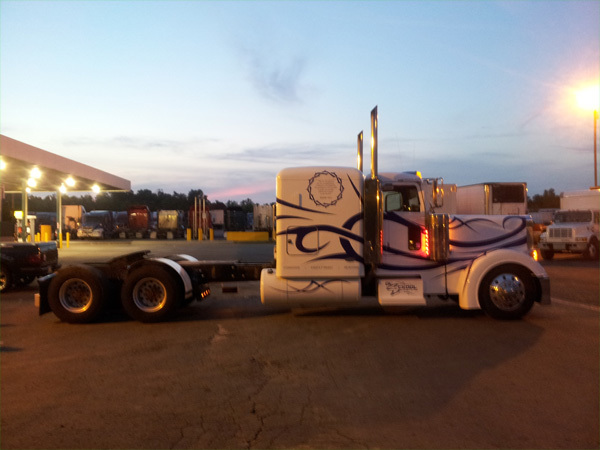 Why not make yourself one of the most noticeable companies out there with a fleet of fully customized tractor trailers? 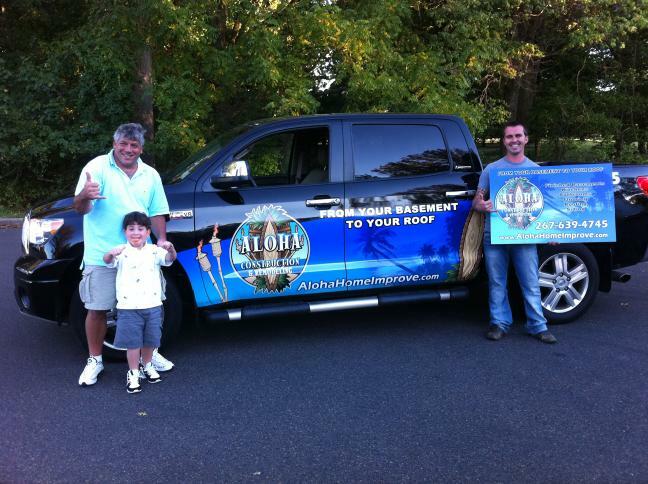 You can promote your business and leave a lasting impression on anyone who sees you on the road. 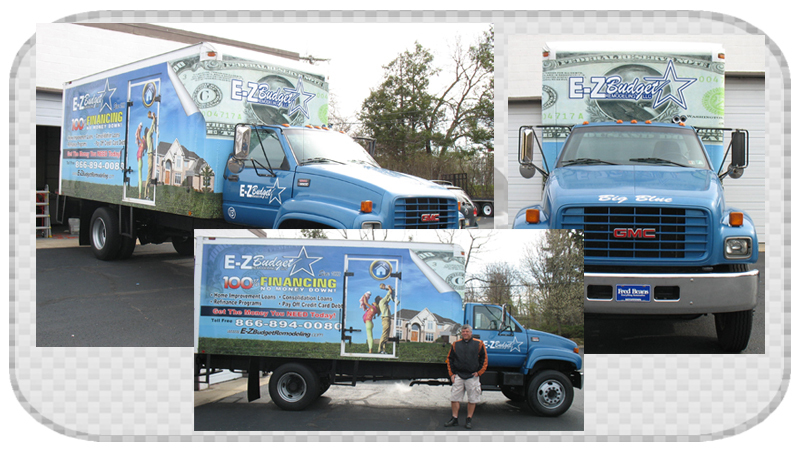 If you’re looking to have a wrap designed for your company’s box trucks, then we can help you accomplish this, as well. 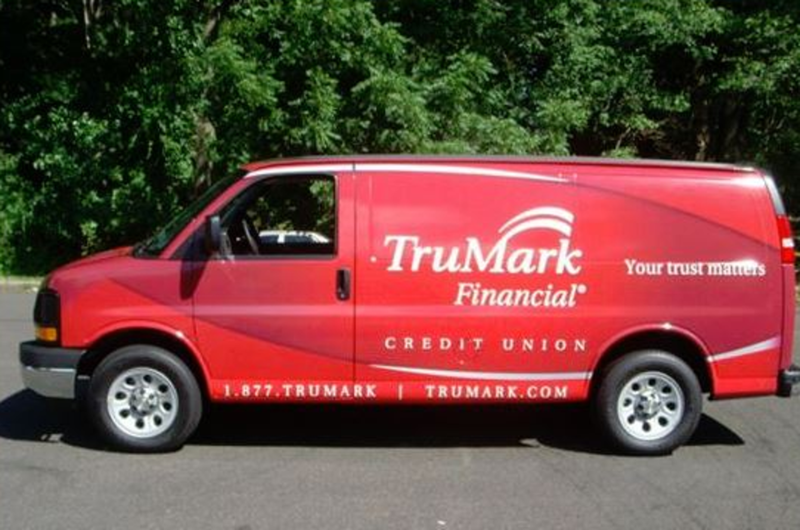 Why not opt for a fresh and modern look for your company vehicles? 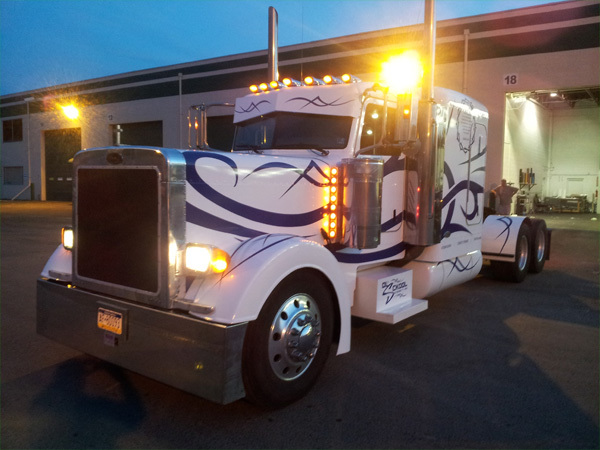 At Apple Graphics, we know what it takes to get your tractor trailers and your box trucks on the road in style. 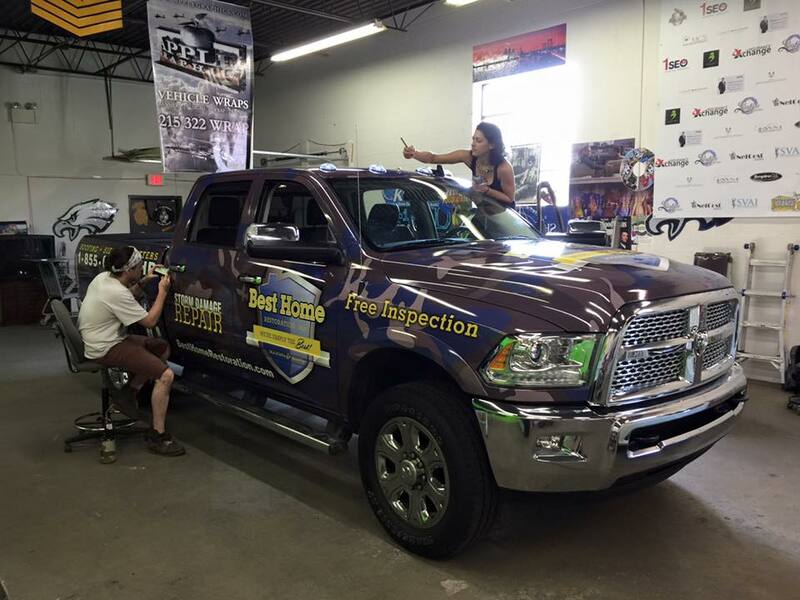 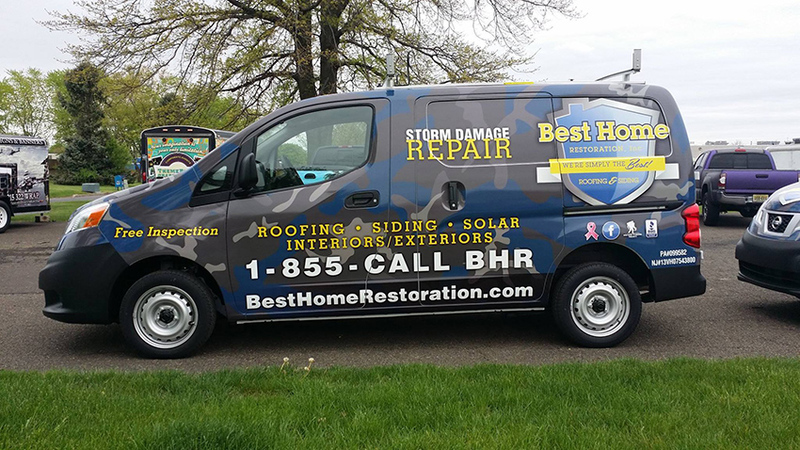 If you’ve never had a vehicle wrapped before, or if you have a few questions about how to get started, our team is ready to assist. 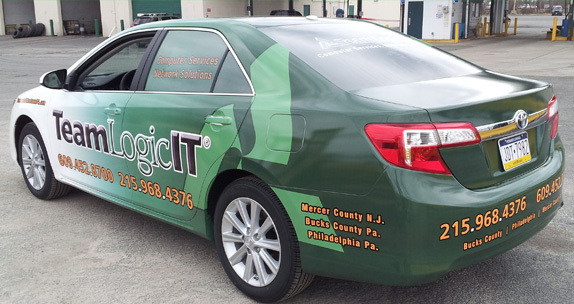 Stop in today, contact us or give us a call at the shop to find out why Apple Graphics is the leader in vehicle wraps for the Philadelphia and surrounding area. 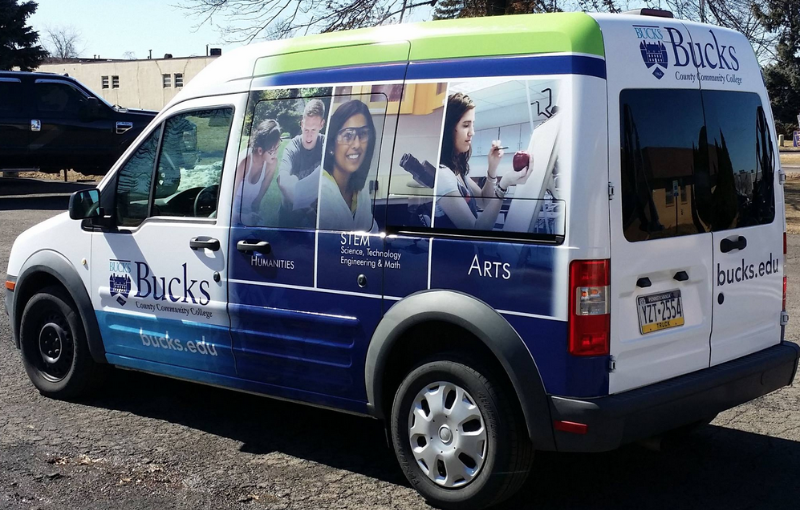 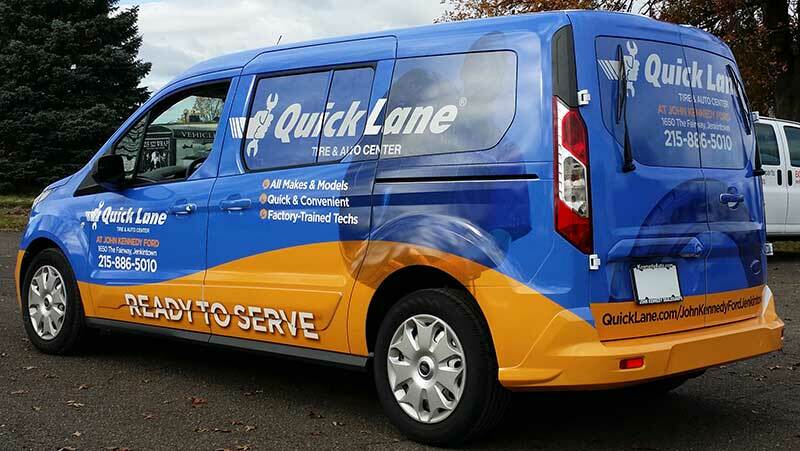 One of our recent wrap projects was on a Ford Transit Connect for Bucks County Community College. 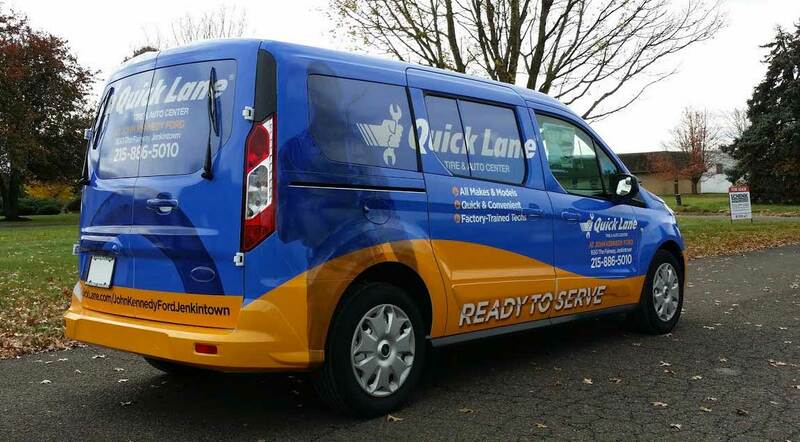 We started with a custom design based on their branding and images and came up with a dynamic design that will surely catch eyes on the road. 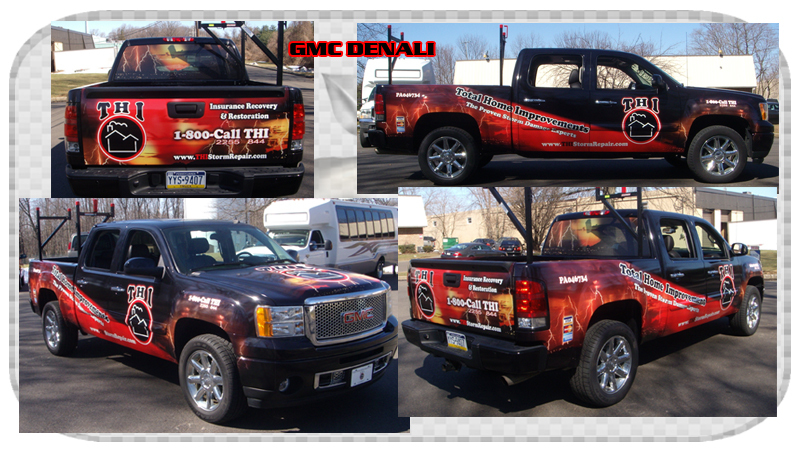 Vehicle Wrap Mobile Advertising is one of the best ways to advertise your company and best return on your investment. 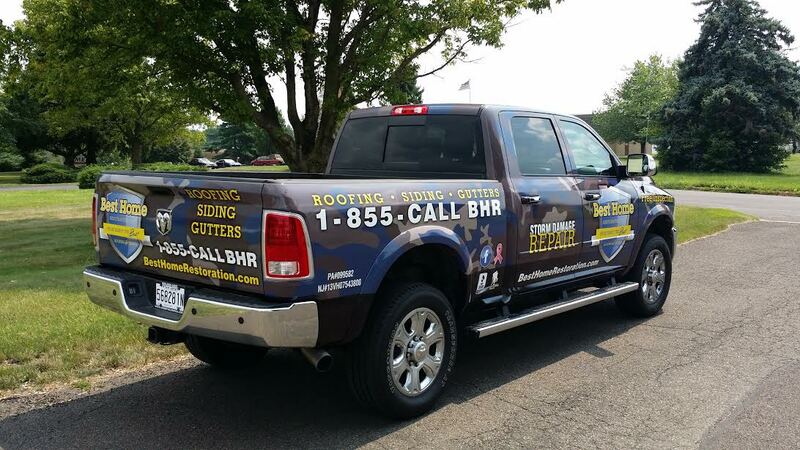 Contact us for a free quote to wrap your vehicle and discuss some options and ideas how to advertise your business! 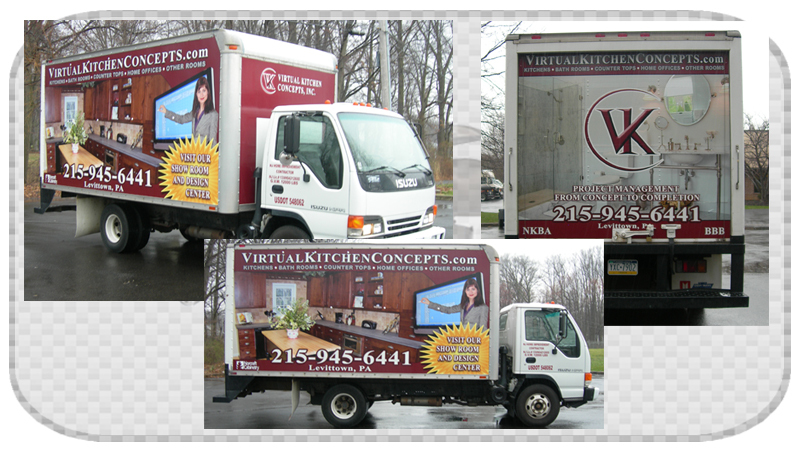 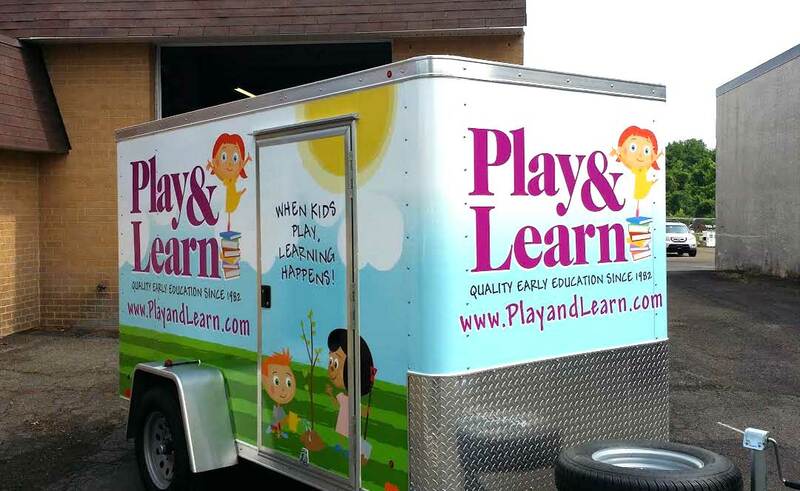 Trucks and Trailer Wraps provide an excellent opportunity to advertise for your business. 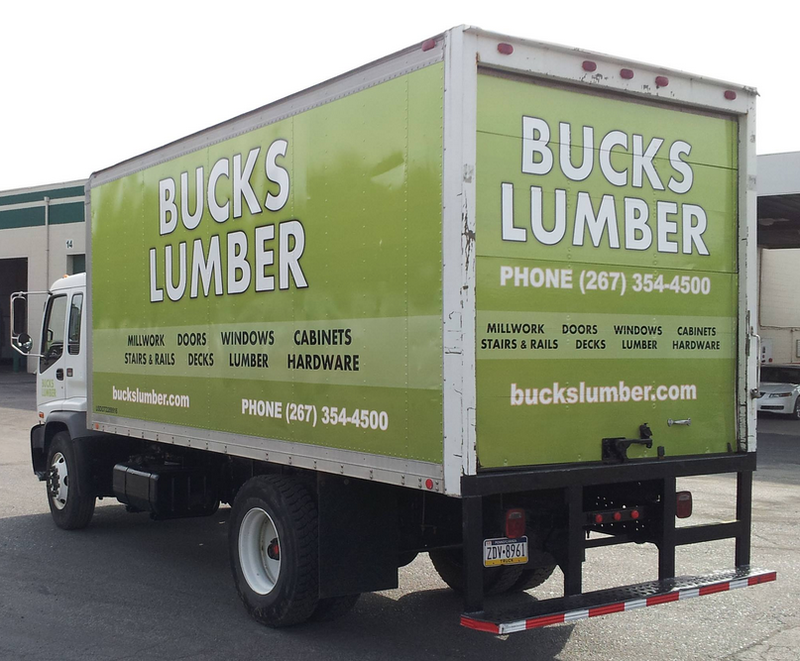 Trucks and Trailer wraps are larger than the average sized vehicle on the road. 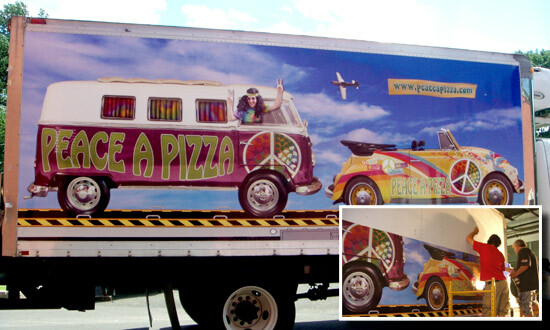 The large surfaces provide the driver with a large scale mobile advertisement which is sure to be seen by many people. 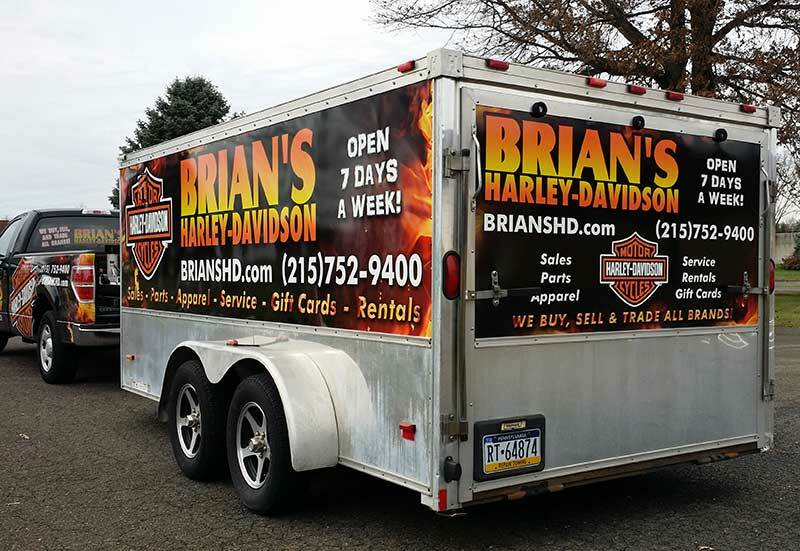 Trucks and trailers have become one of the most effective ways to advertise today. 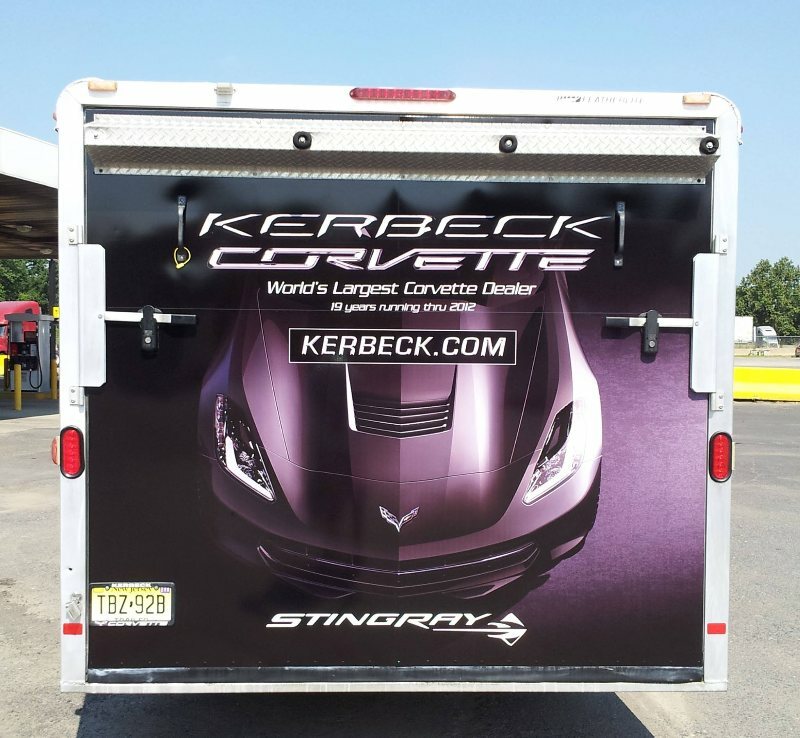 They have become mobile marketing billboards all across the United States. 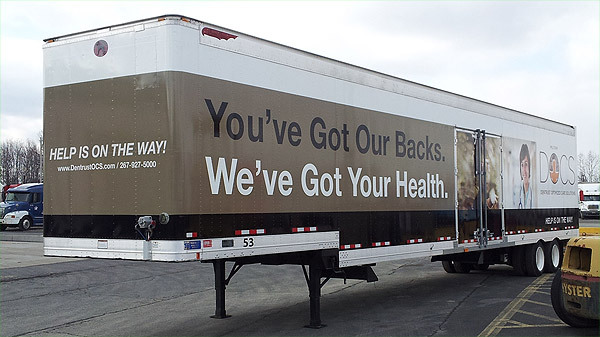 Today 74% of motorists are positively influenced by companies and products advertised on trucks, according to the Interstate Advertising Corporation. 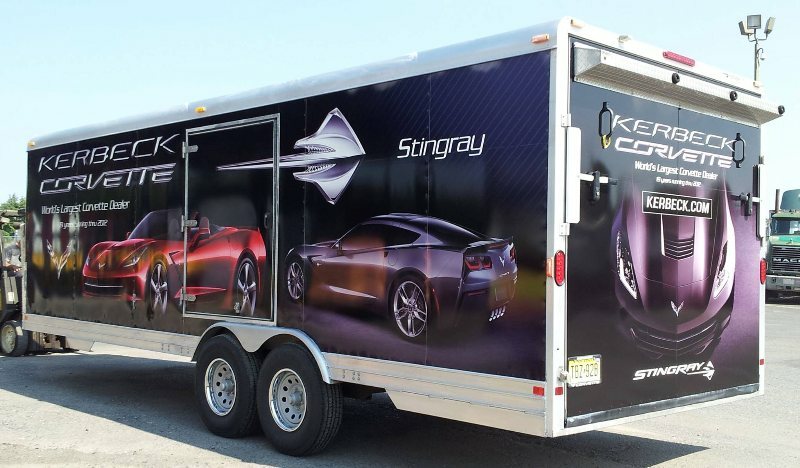 By advertising on your truck or trailer, you can generate more than 600 visual impressions for every mile driven, according to the American Trucking Association. 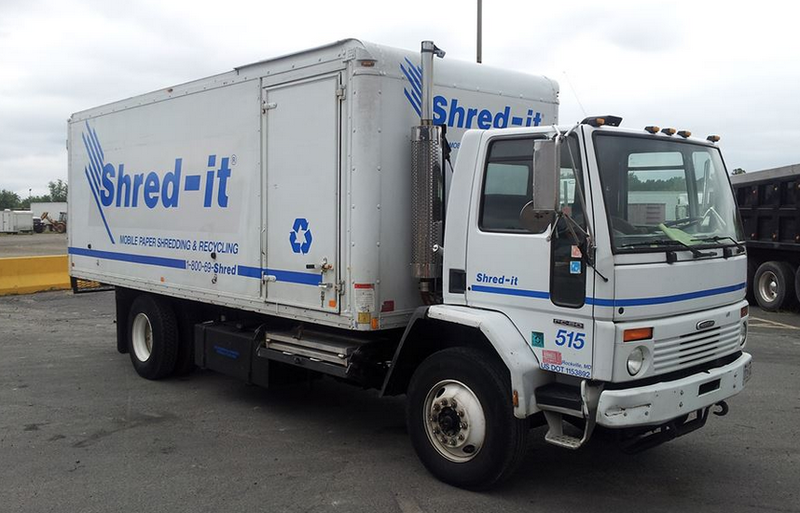 There is probably nothing more important in your business’s distribution system than the semi trucks and trailers that you use to deliver goods. 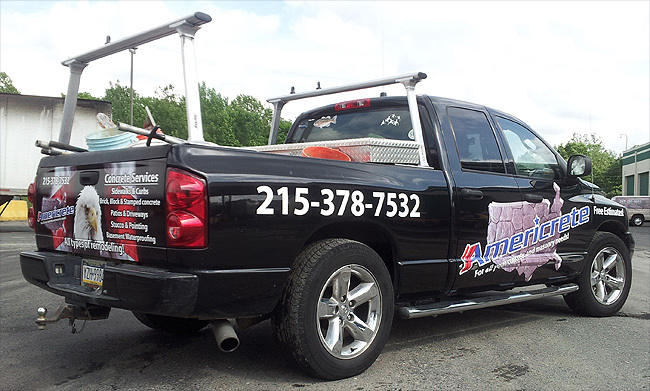 If your trucks or trailers are on the road everyday anyway, you can make the most of this by adding custom graphics. 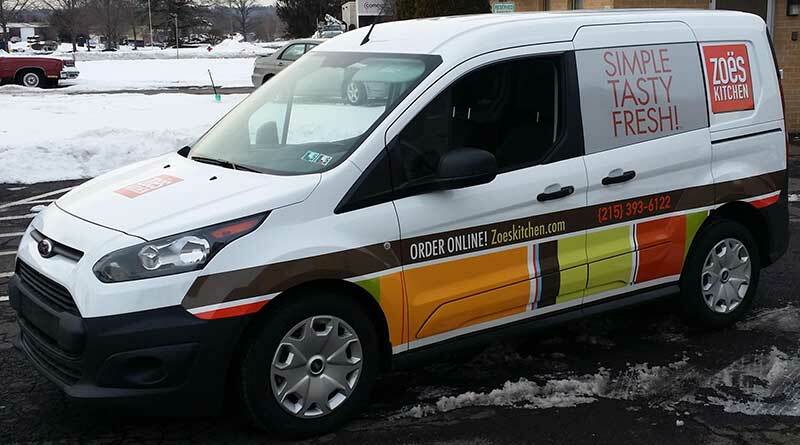 Get the most out of your investment and turn your delivery and distribution fleet into an effective marketing tool. 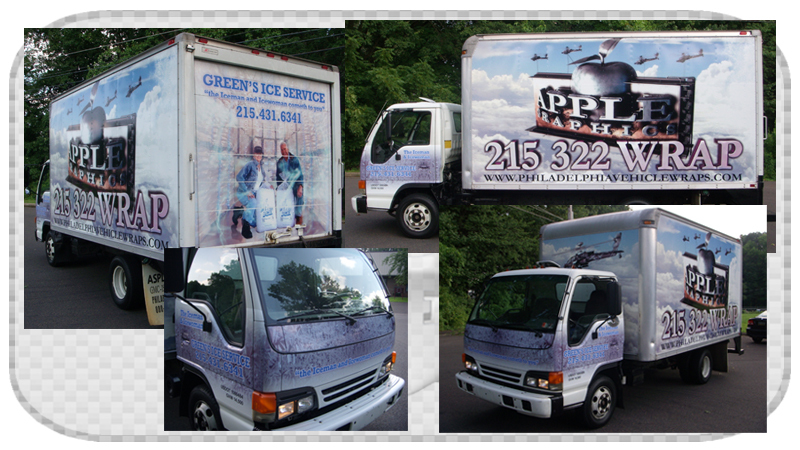 Call or email us about truck and trailer wraps from Apple Graphics. 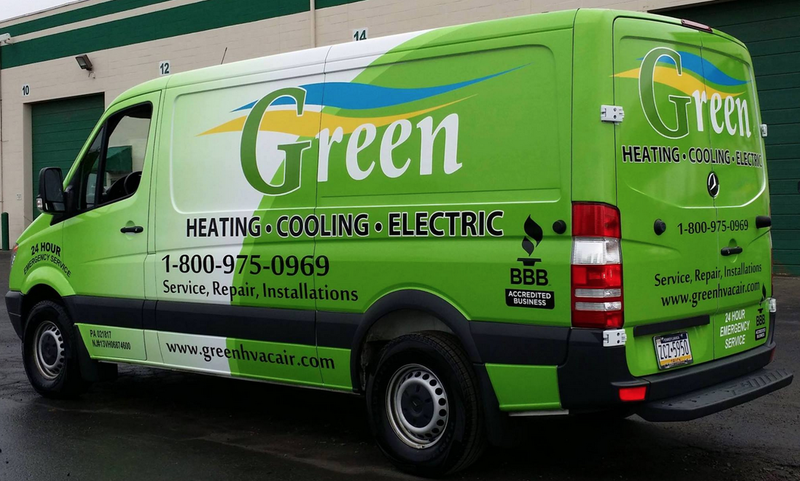 Once you see what we've done for businesses like your own, you’ll see how we really take quality and design into consideration. 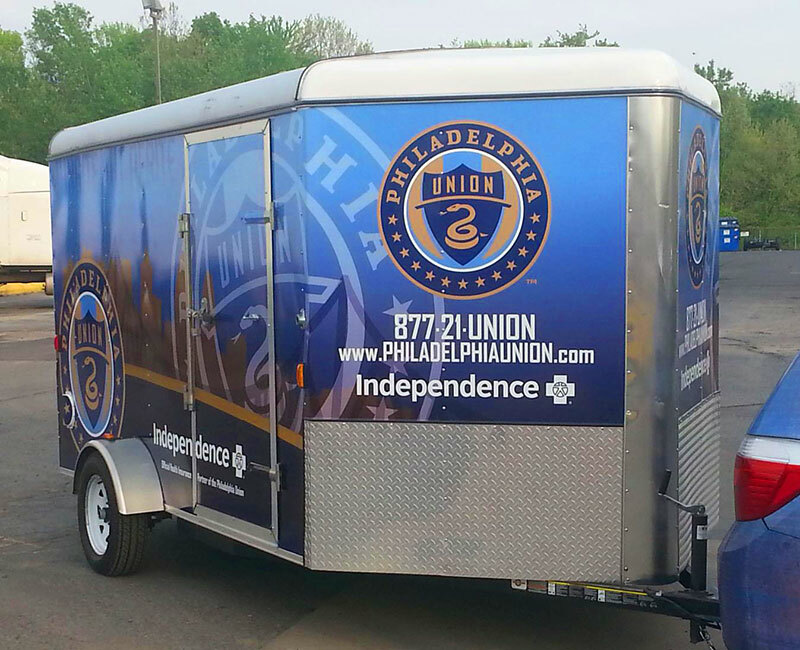 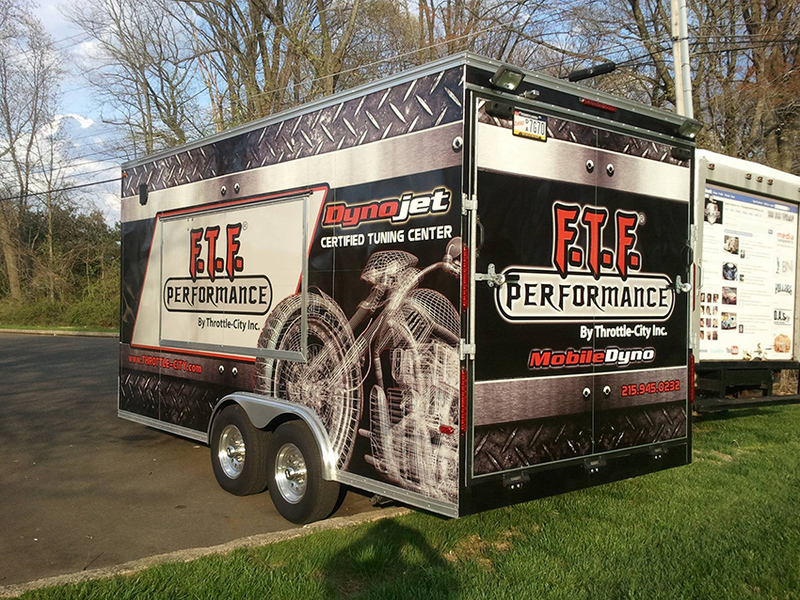 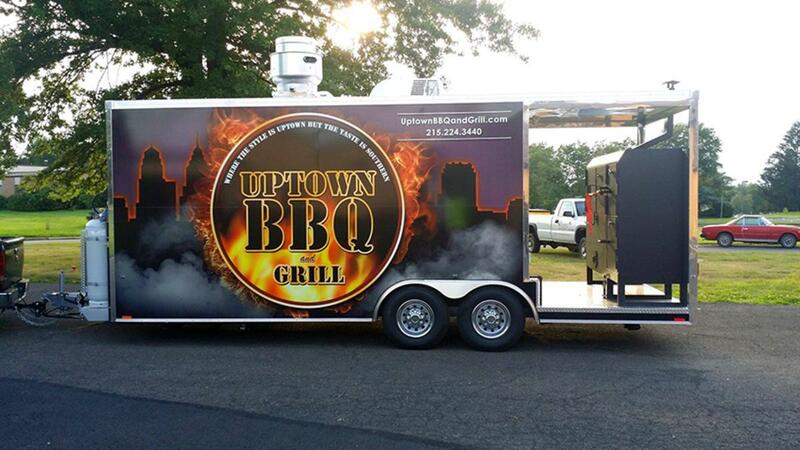 We understand that committing to a complete trailer vinyl wrap can seem like a big undertaking. 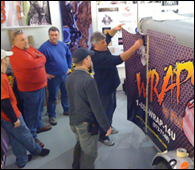 Yet in fact, the average trailer wrap cost is much lower than repainting while offering durability and ease of repair. 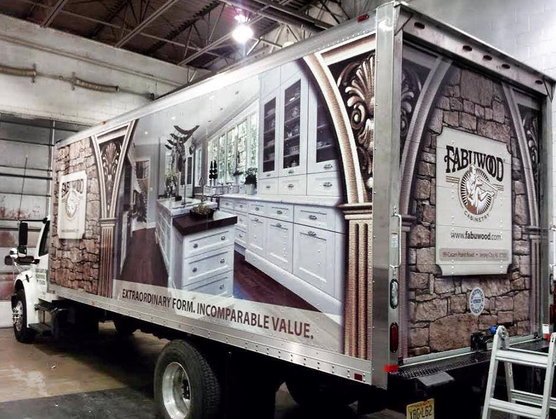 If you’re interested in creating the maximum impact possible for your business, contact Apple Graphics today and talk to us about your semi truck wrap and trailer graphics needs. 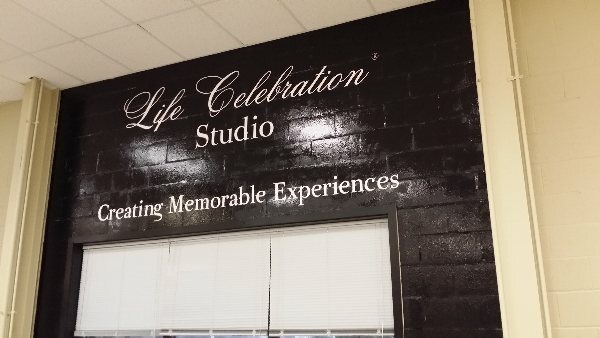 Wall Wraps and Murals by Apple Graphics Inc! 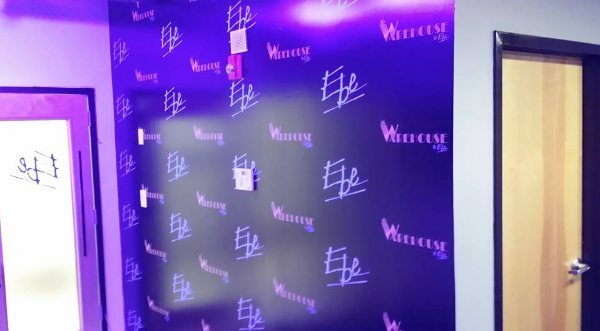 Are you bored of your walls? 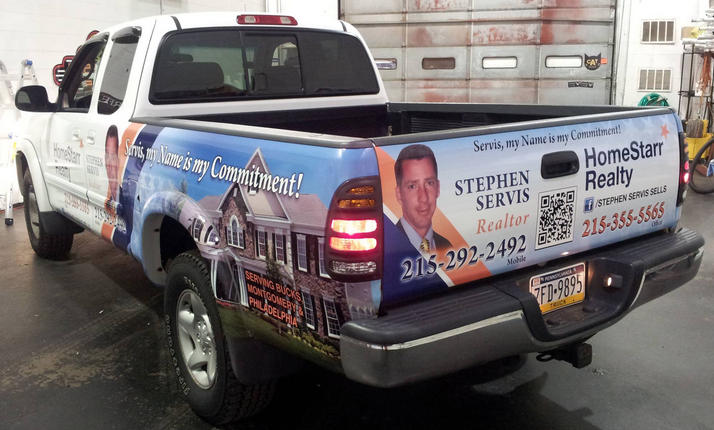 Looking for a change in environment but don't want the commitment? You have arrived! 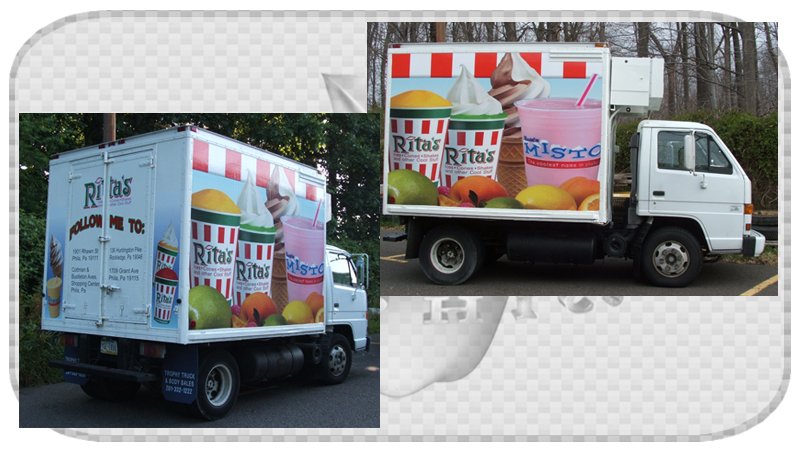 Apple Graphics can provide you solution you're looking for! 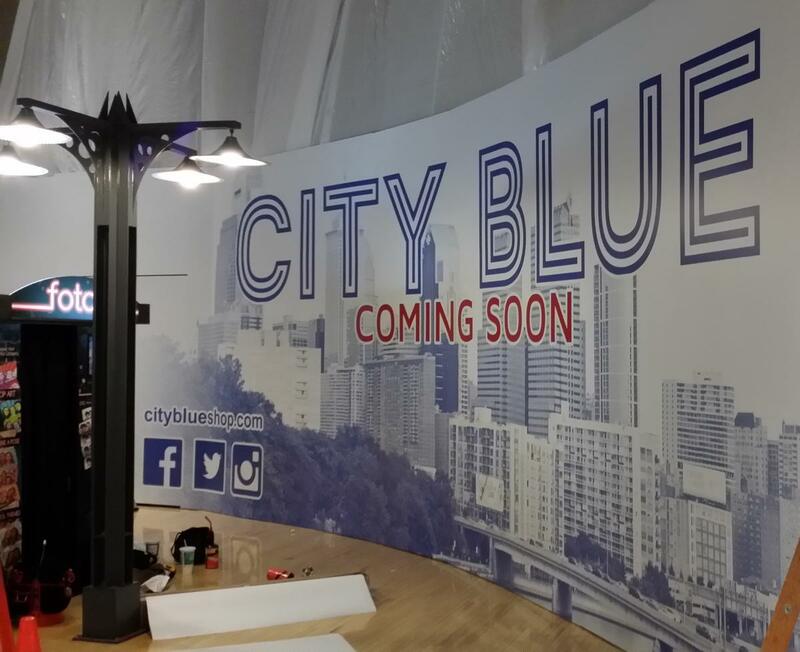 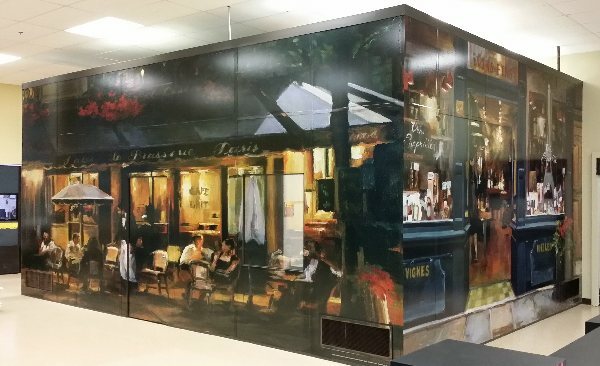 Vinyl wall wraps and murals are a great way to transform your home, office or store with just a few simple steps. 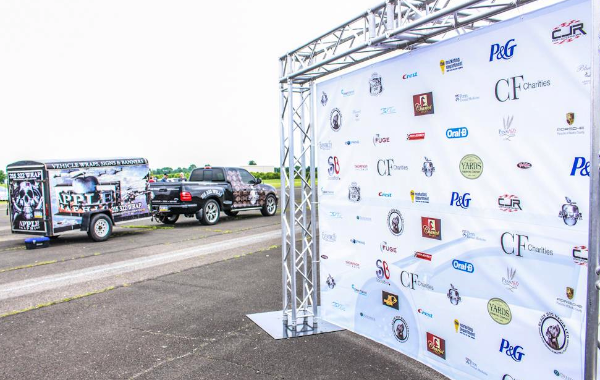 Whether its indoor or outdoor we can wrap it, just let us know the size and whatever ideas you have in mind and we can make it a reality. 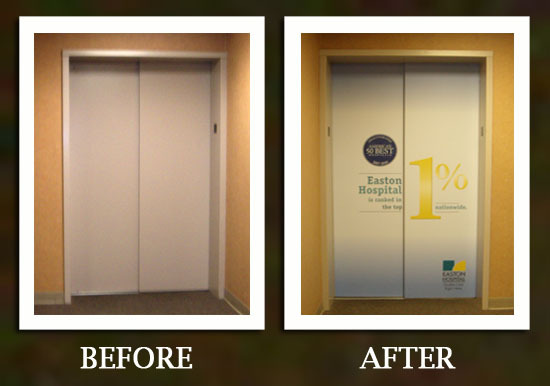 Wall Wraps and Mural graphics are perfect for adding something simple and eye catching that is unique for your personality or business brand. 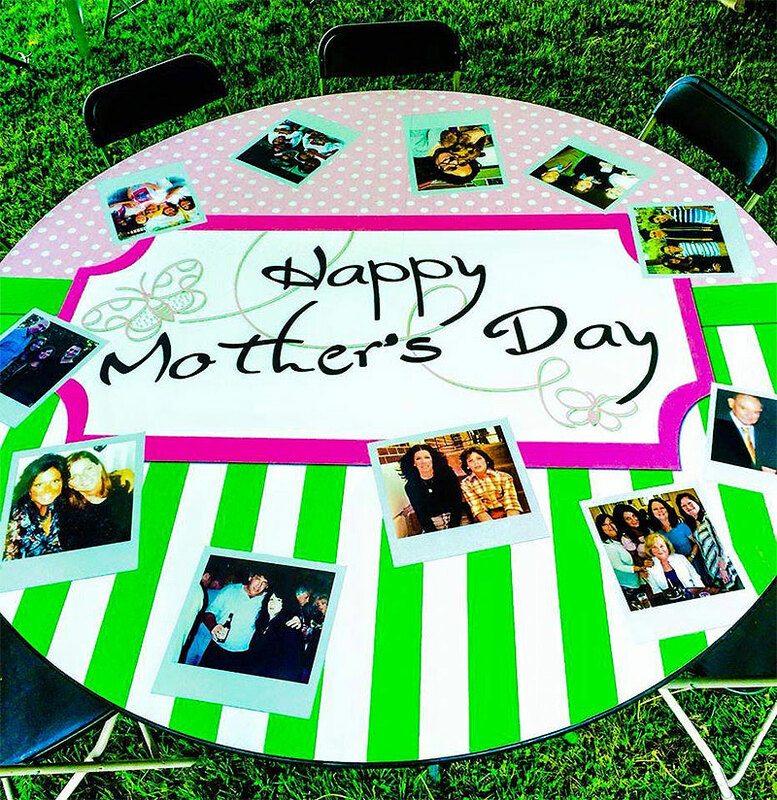 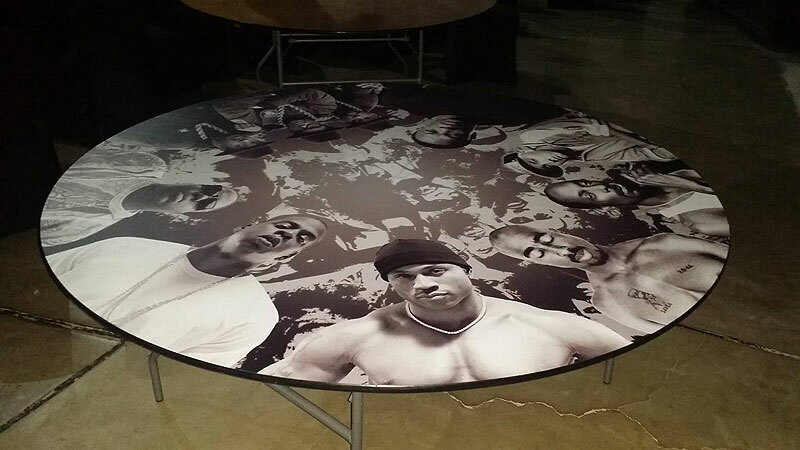 Impress friends and relatives at your next event by adding personalized graphics, or you can send us some of your family pictures and get them super sized. 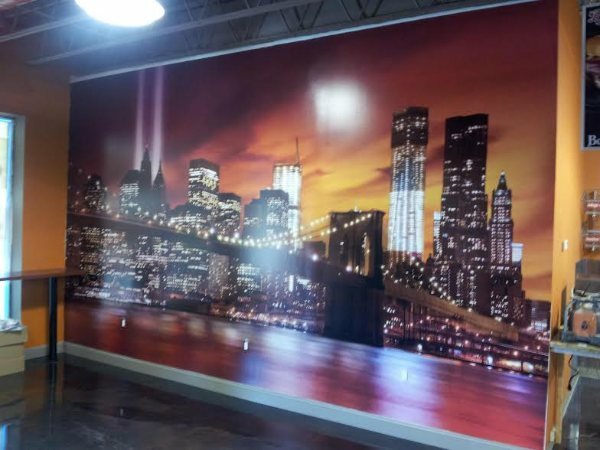 Adding graphics to your store can leave a lasting impression on customers and completely change the atmosphere of your space. 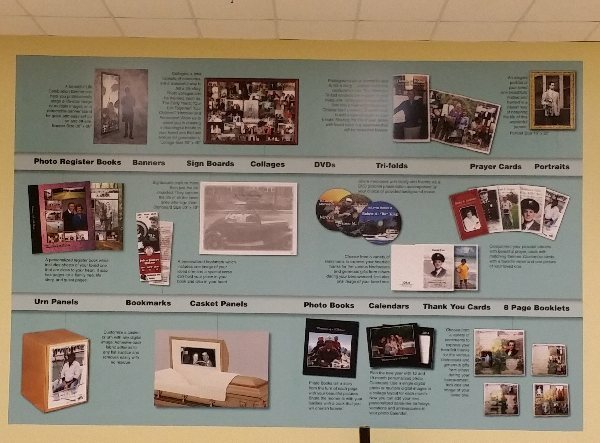 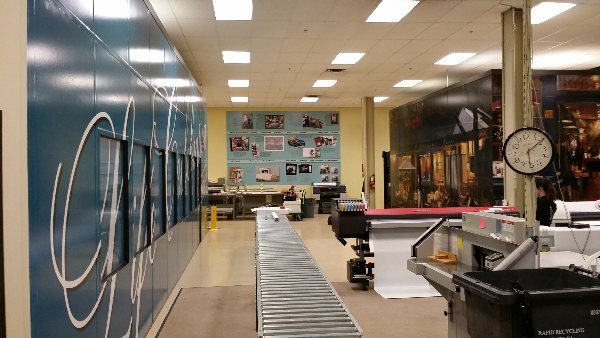 Check out these recent photos of a wall wrap project to get some ideas of what you might be interested in. 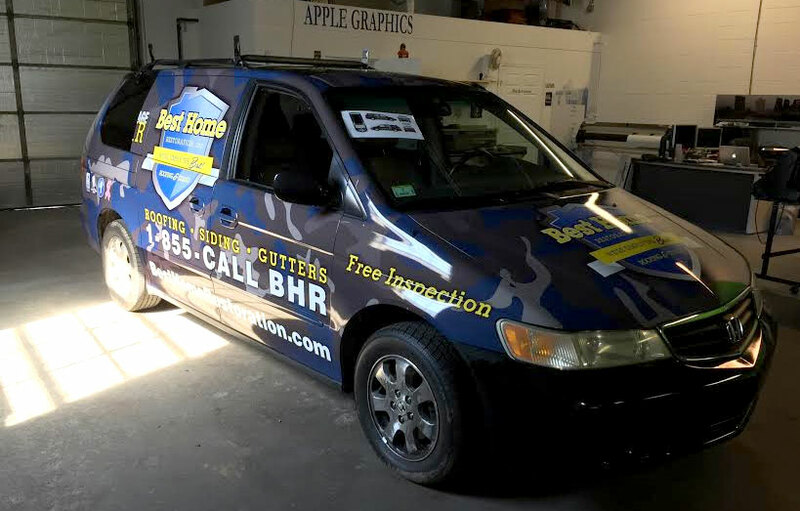 We take care of everything from design to completion, our main goal here at Apple Graphics is to satisfy your needs, so let our in house graphic design team take the reigns and make your ideas a reality. 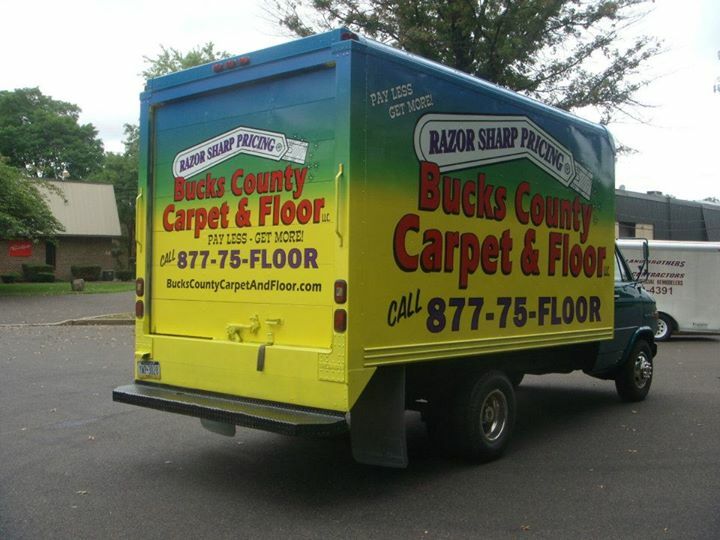 First impressions are important for a business whether you have been in business for years or you are just starting out, it is critical to display a clear message and speak to consumers within the first few seconds of contact. 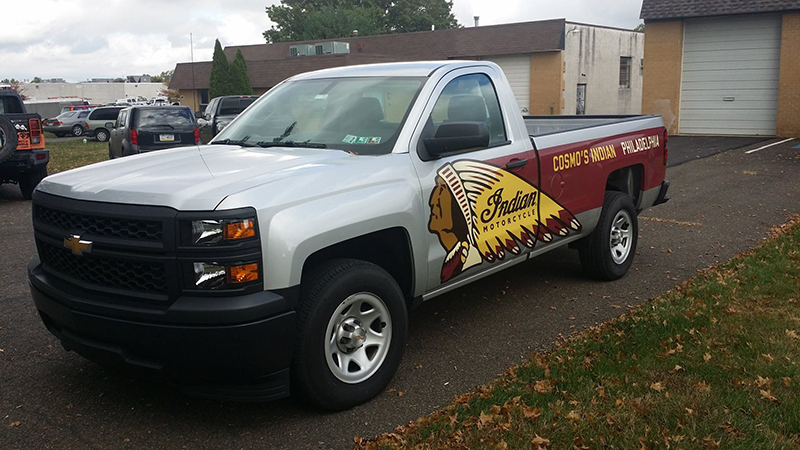 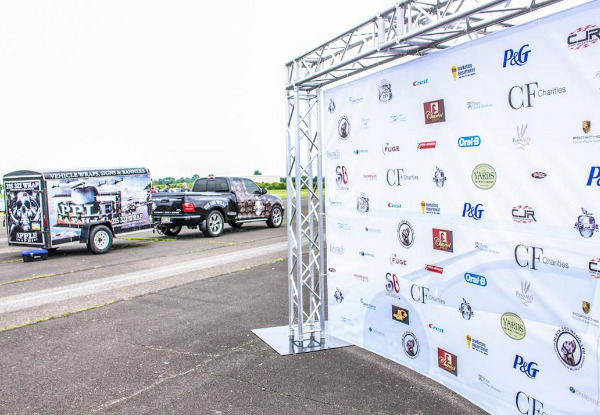 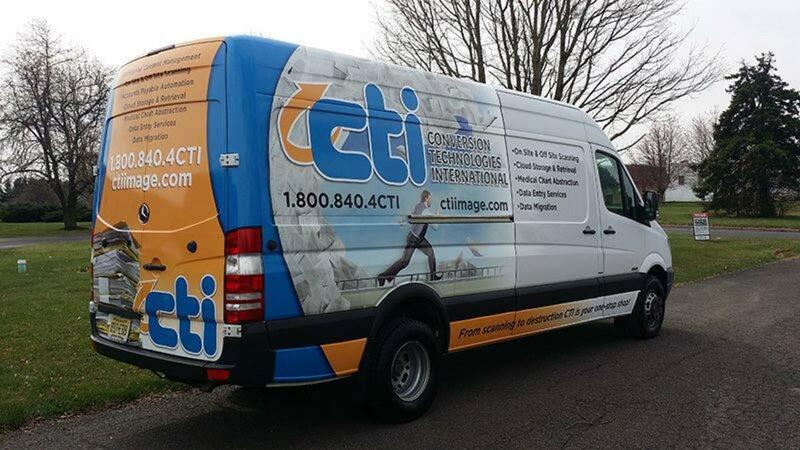 Custom vehicle wrapping and fleet wrapping does just that, it is a cost effective way that takes potential advertising and branding space and brings it to your target audience. 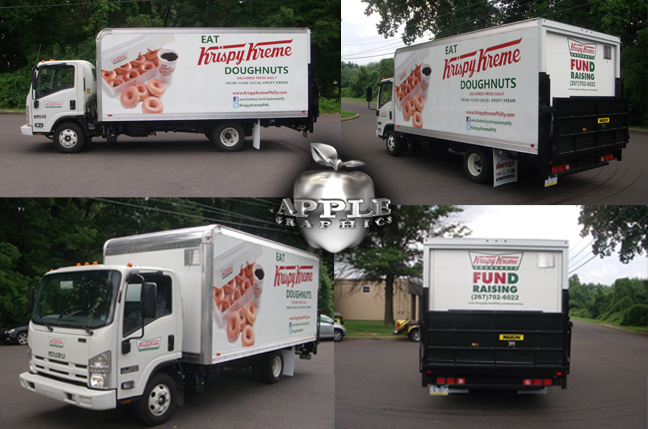 Here at Apple Graphics we help you to enhance the way your business is perceived by using your custom graphics or ideas to design a fleet of vehicle wraps for your company. 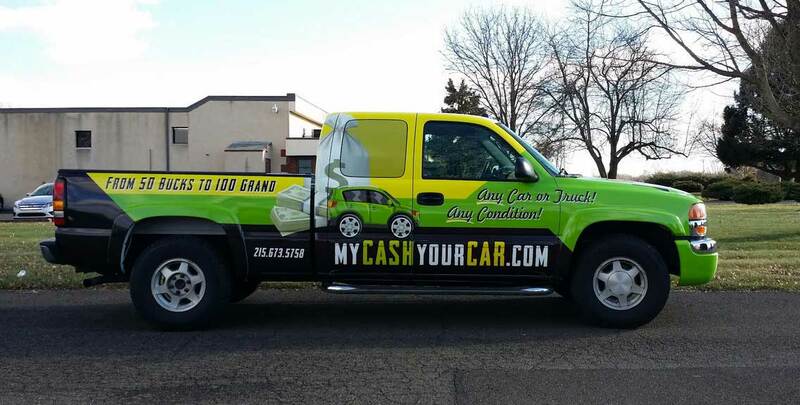 How about making money just by driving your car? 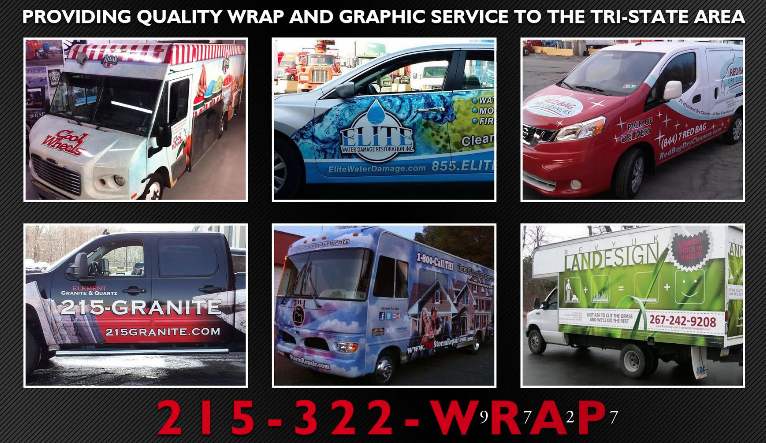 Fleet wrapping is all about attacking your potential customers by turning your fleet of vehicles into mobile billboards, and helping you to in creating a greater marketing strategy for your business. 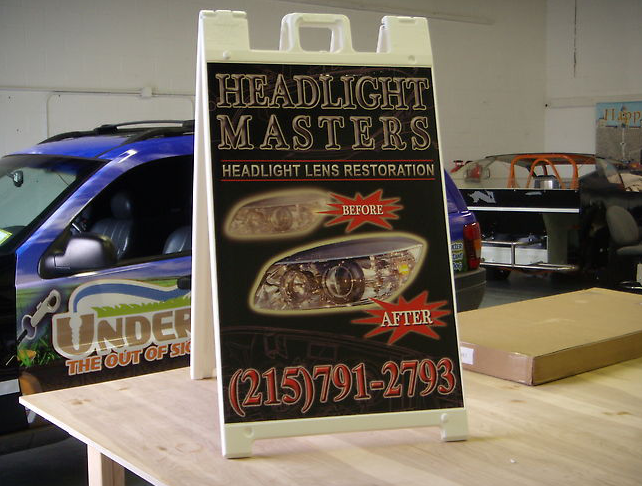 Instead of waiting for customers to walk by or see your stationary signs why not bring the sign to them. 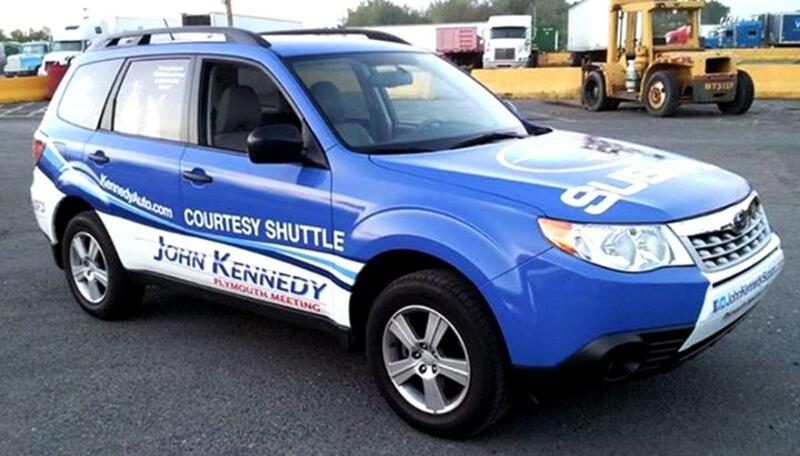 When your employees are going out on meetings or appointments in one of your fleet vehicles your sure to generate thousands of visual impressions on your target audience. 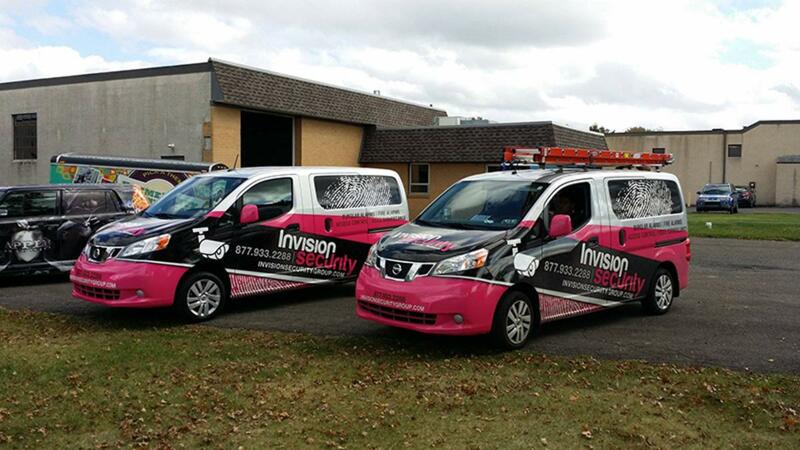 Fleet wrapping is also a great way to help your customers feel secure with your business, by branding your company vehicles with your custom logo and contact information it leaves a feeling of commitment and security that your in it for the long haul. 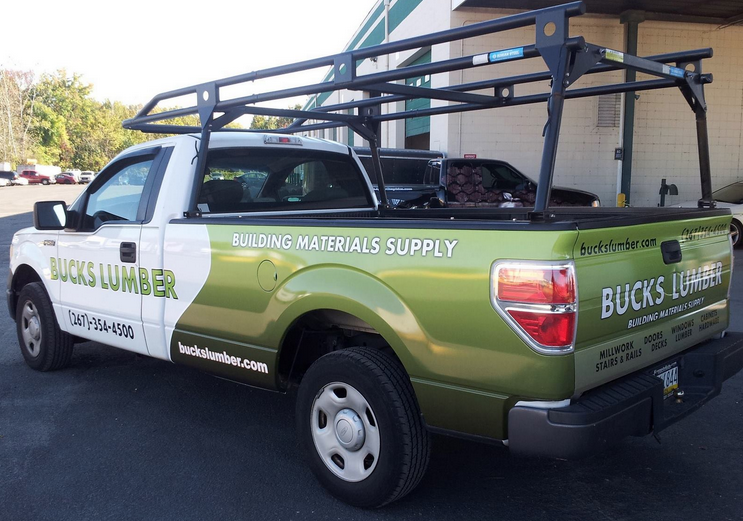 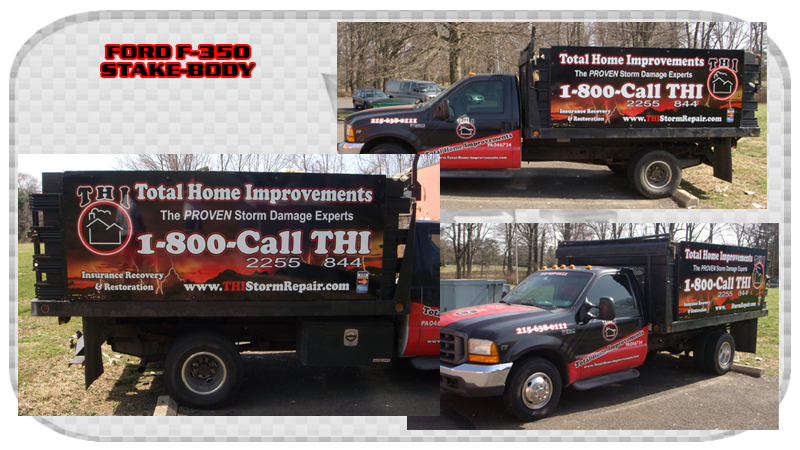 Call or contact us for a free consultation for creating custom wrap solutions for your fleet! 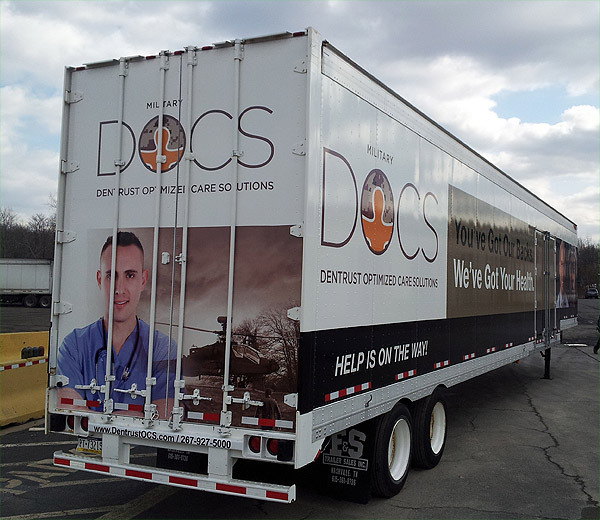 Another awesome full wrap of a custom Tractor Trailer Rig for Dentrust Optimized Care Solutions. 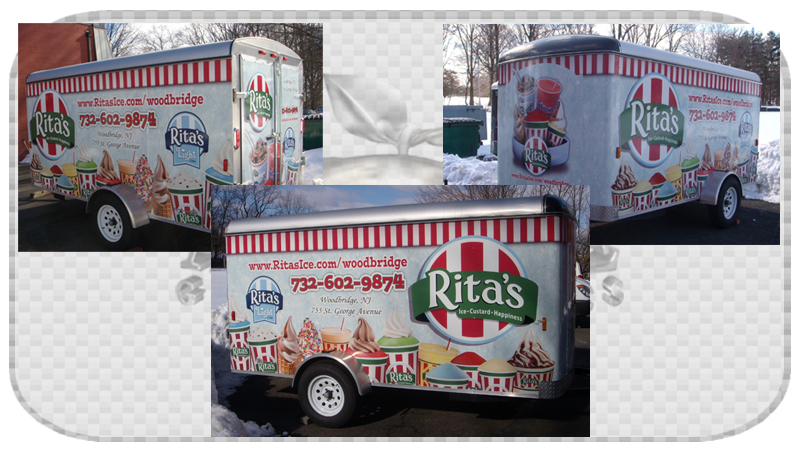 We had fun wrapping this entire rig with a custom design. 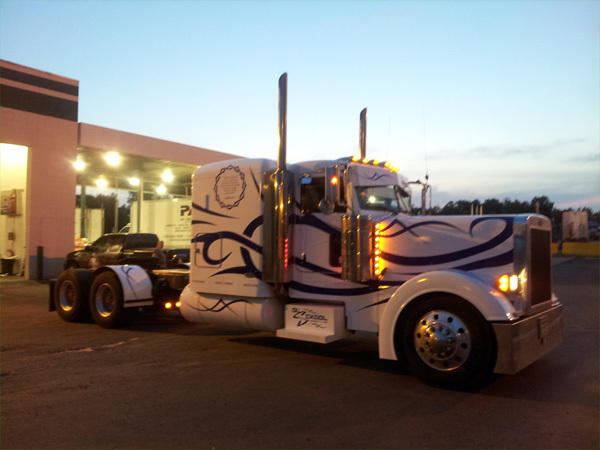 Since our truck stop garage fits the entire tractor trailer rig inside, we can wrap any size rig at any time of the year. 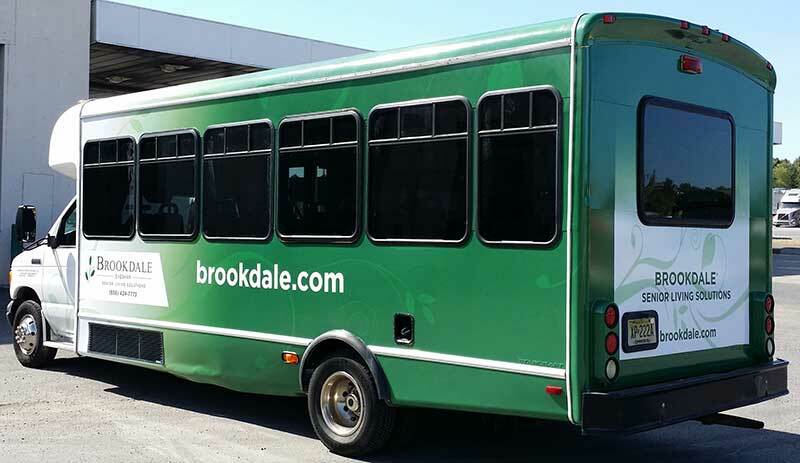 This will definitely be noticeable on the road as it acts like a moving billboard and grabs the eye of people on the street. 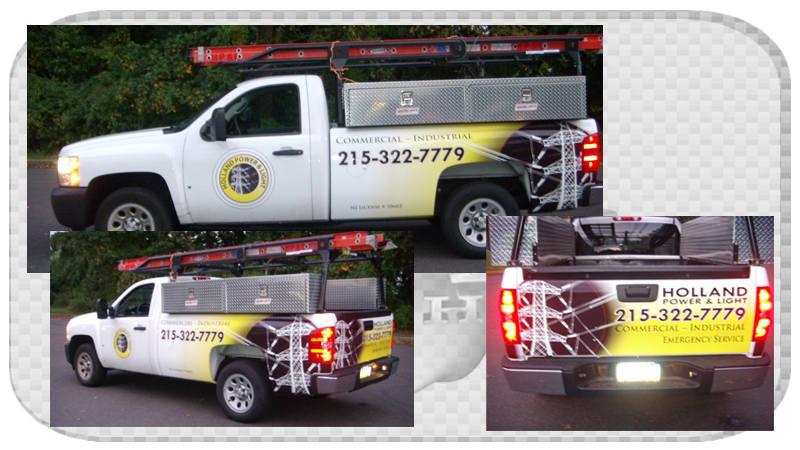 Here are several photos right after we delivered the finished product over to the client. 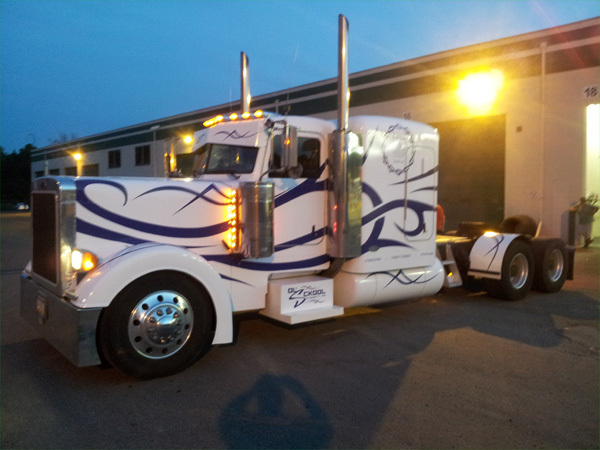 One of our recent projects was for a Custom Tractor & Trailer wrap. 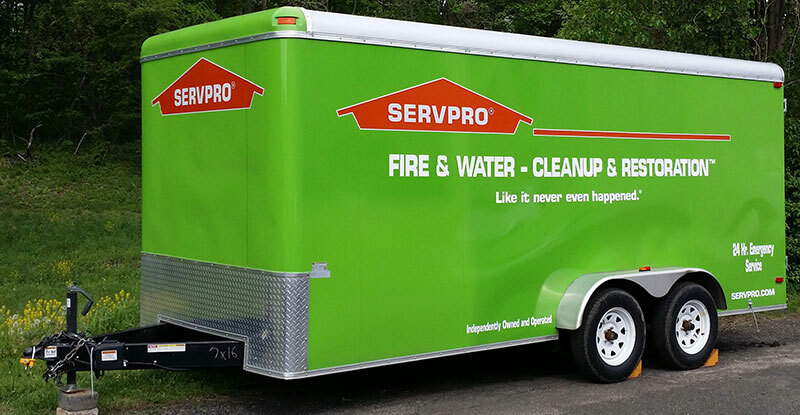 This new design makes the trailer looks very original and unique.